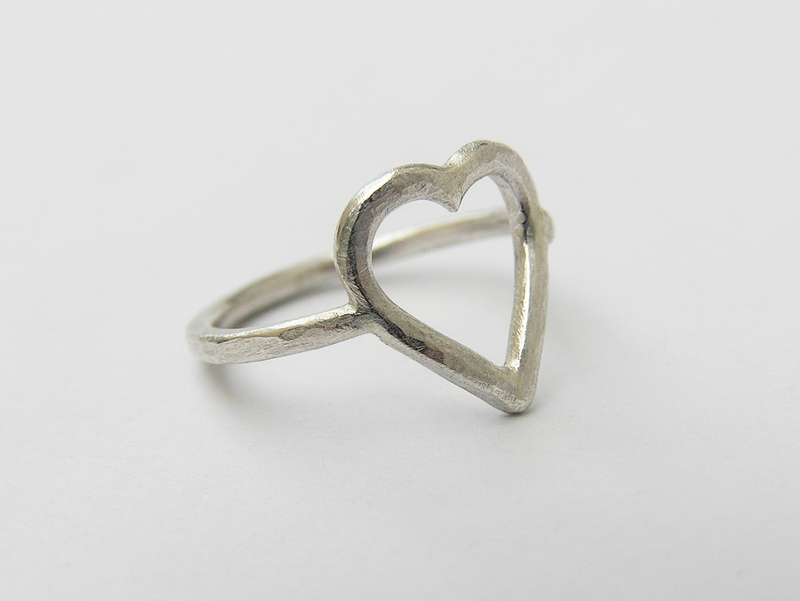 I love rings. 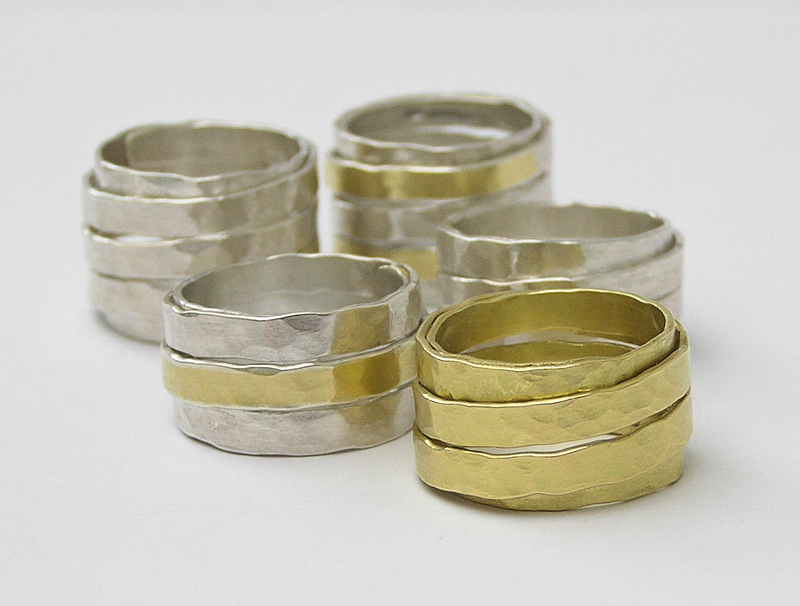 They feature in most of my design collections, and can often be worn stacked in different combinations. 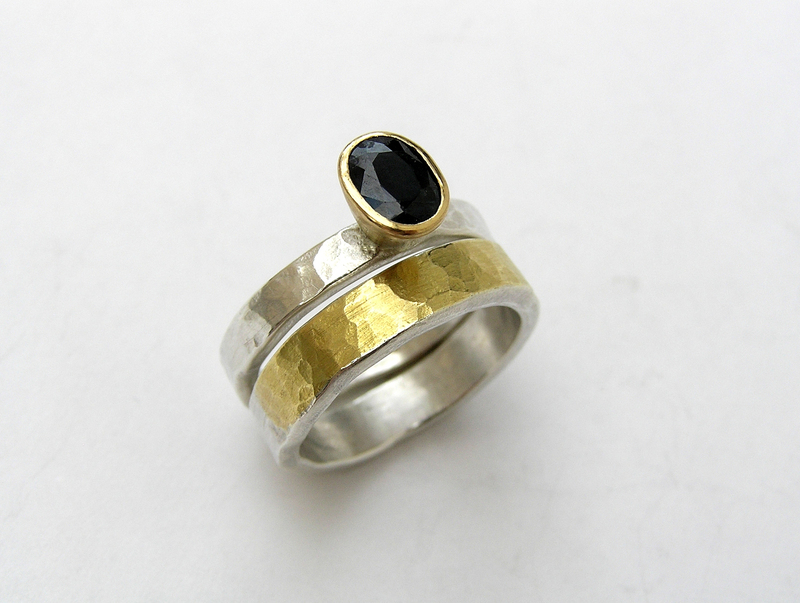 I've also made a number of stone-set ring commission styles, which often incorporate customers' own stones and materials. 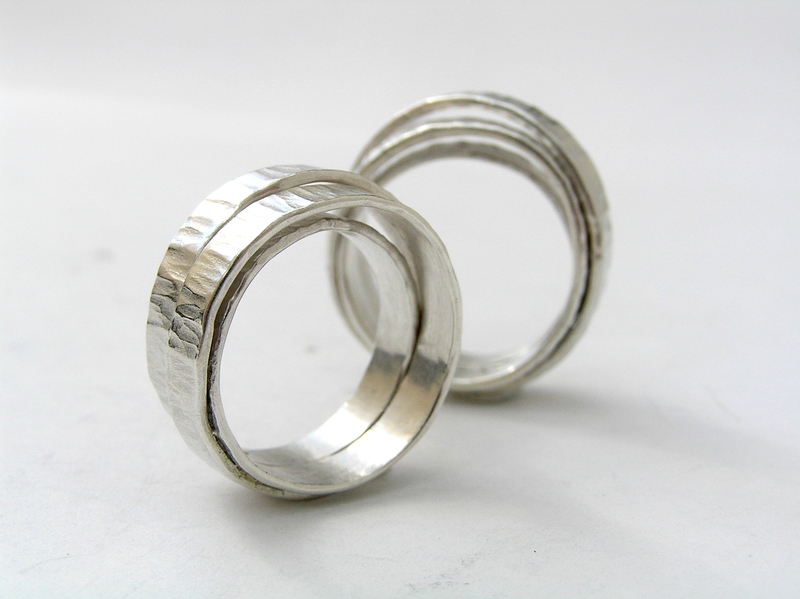 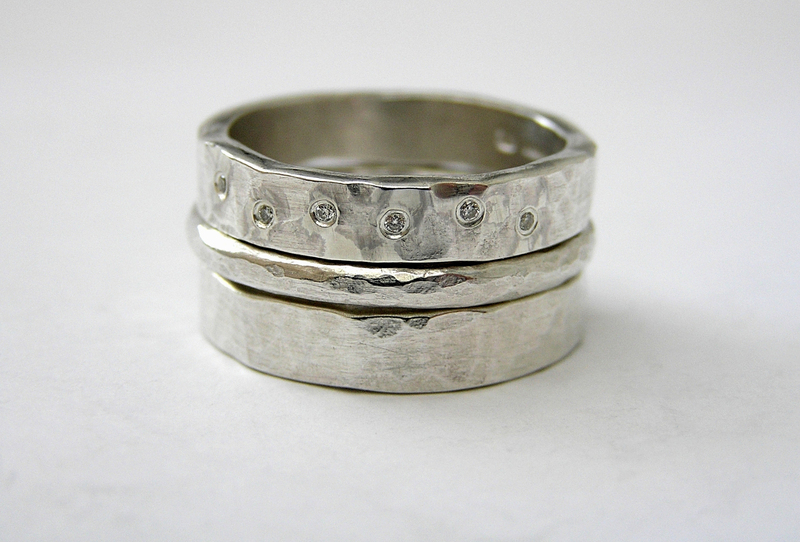 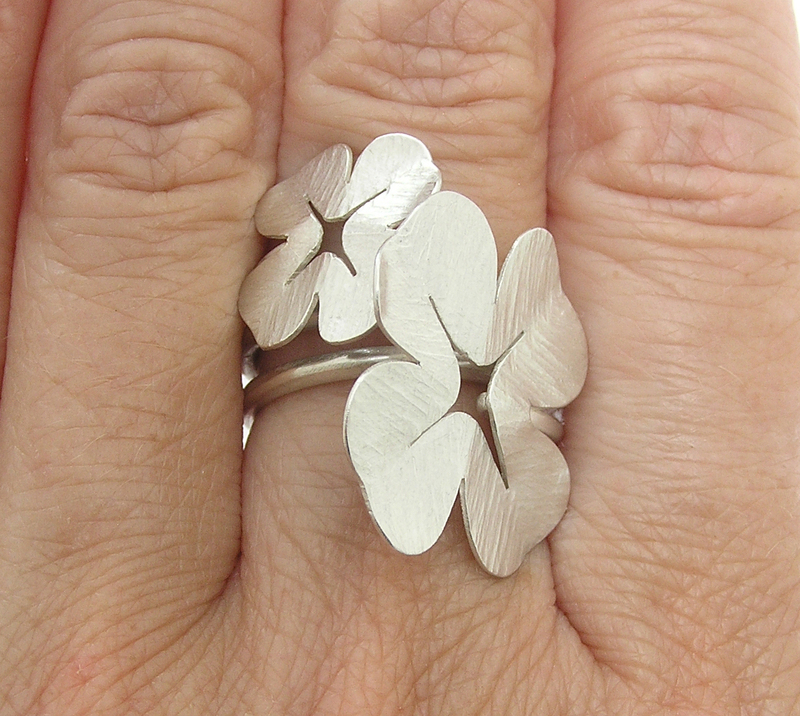 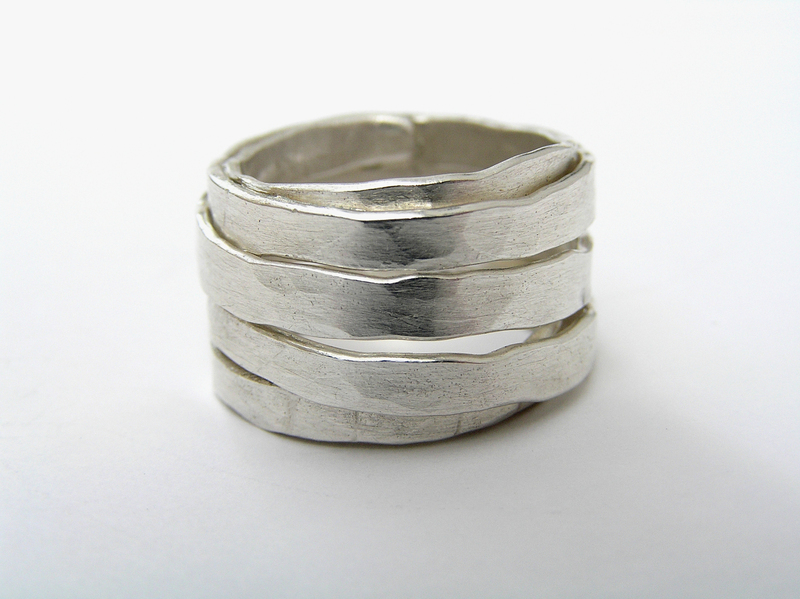 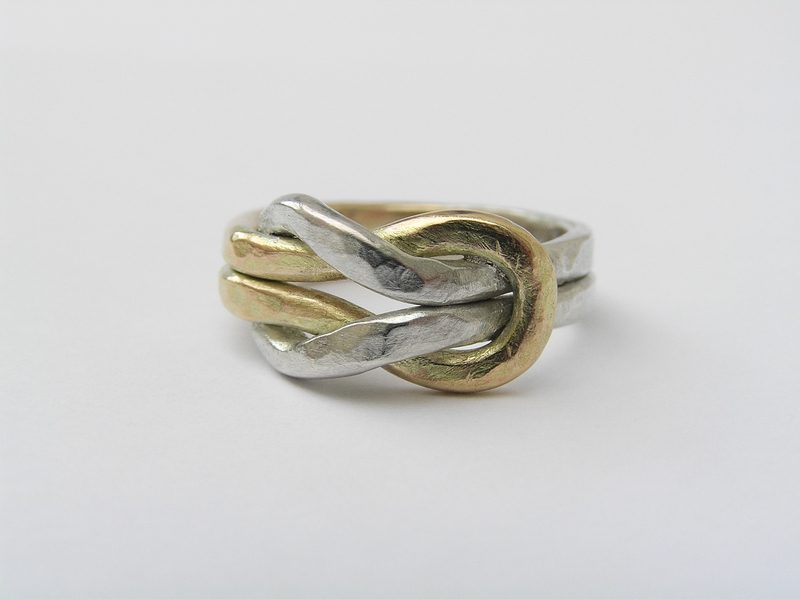 Prices vary and may depend on the materials/stones used - as a guide, prices for silver rings range from £60-£180. 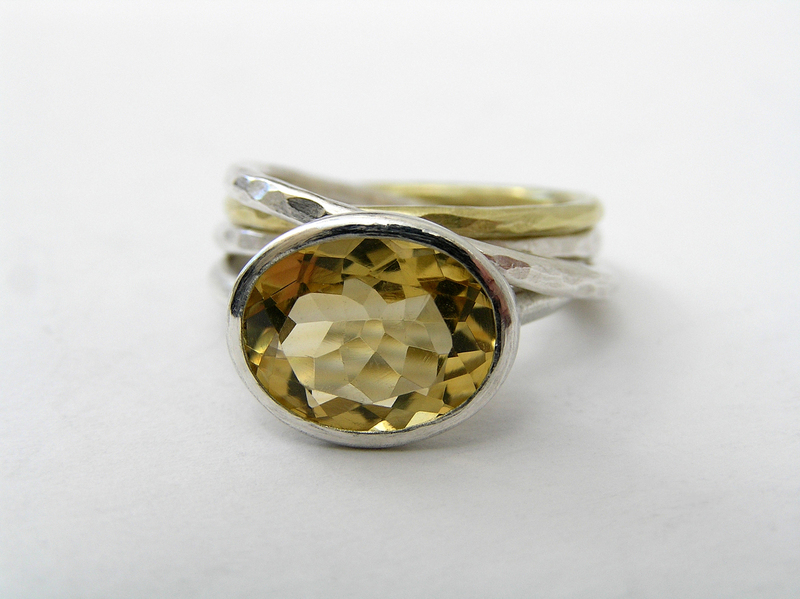 A current pricelist for silver jewellery is available on request, and I can quote on gemstones, silver-with-gold, gold, and bespoke items individually. 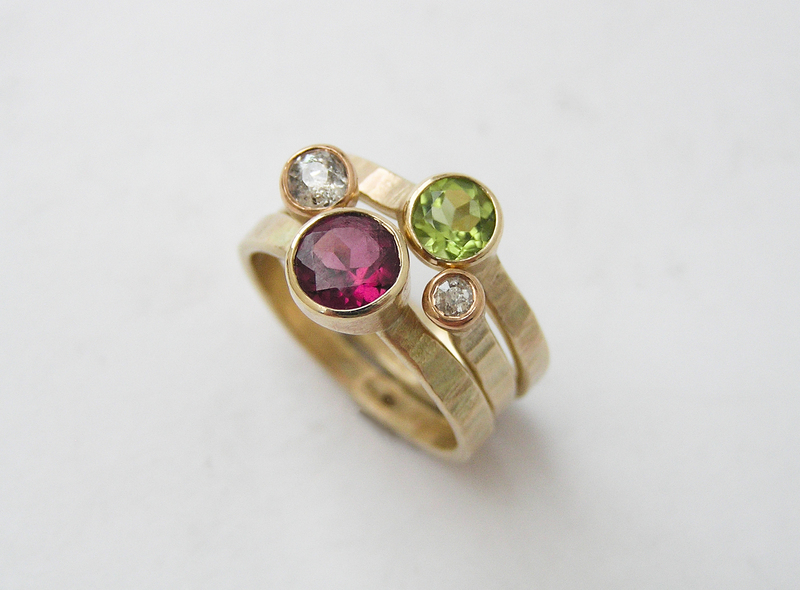 Exact colours of gemstones may vary from the images shown. 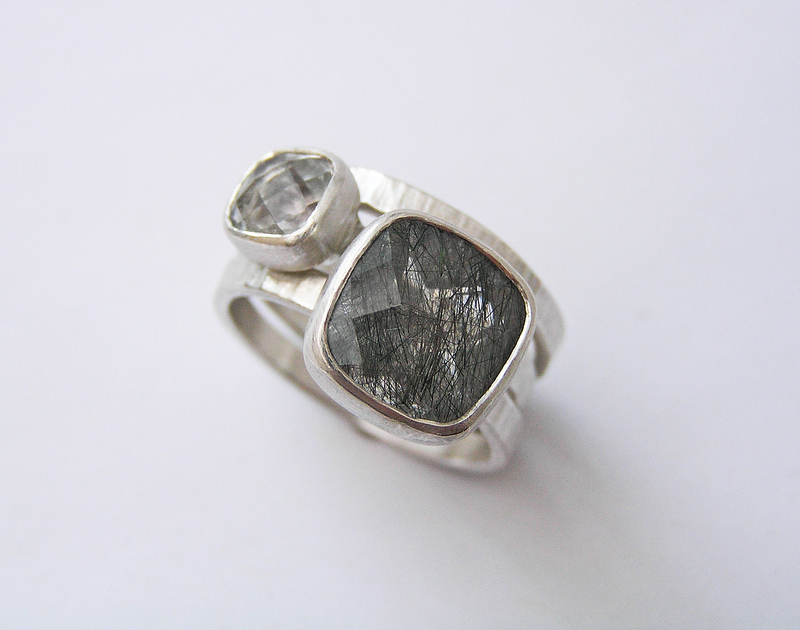 Visit my contact page for enquiries. 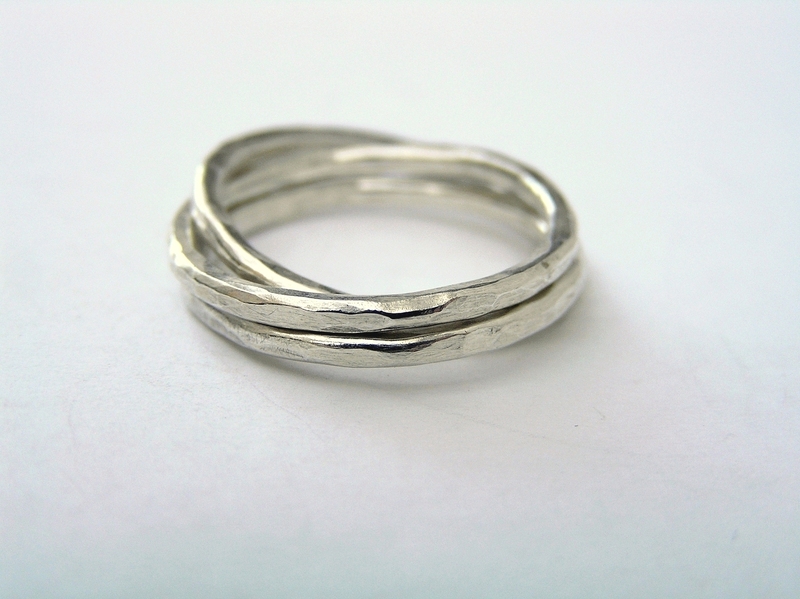 Slim ring approx 10mm wide, standard ring approx 14mm wide. 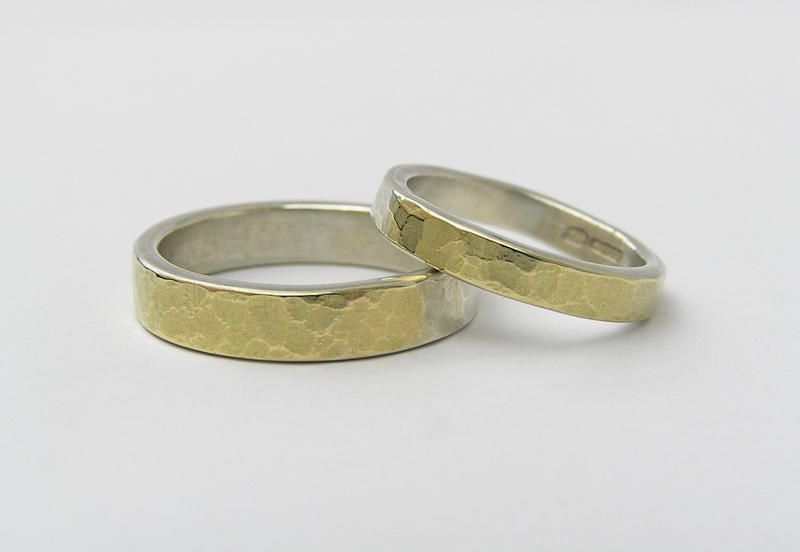 Available in silver, gold, or a mix of silver or gold with contrasting gold overlay. 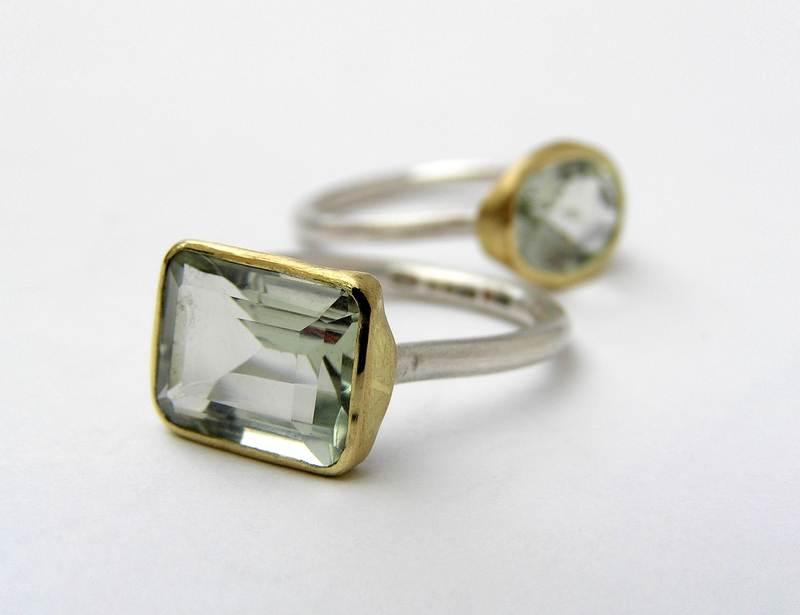 (Top) 8x8mm Green Quartz, (bottom) 10x10mm Tourmalated Quartz. 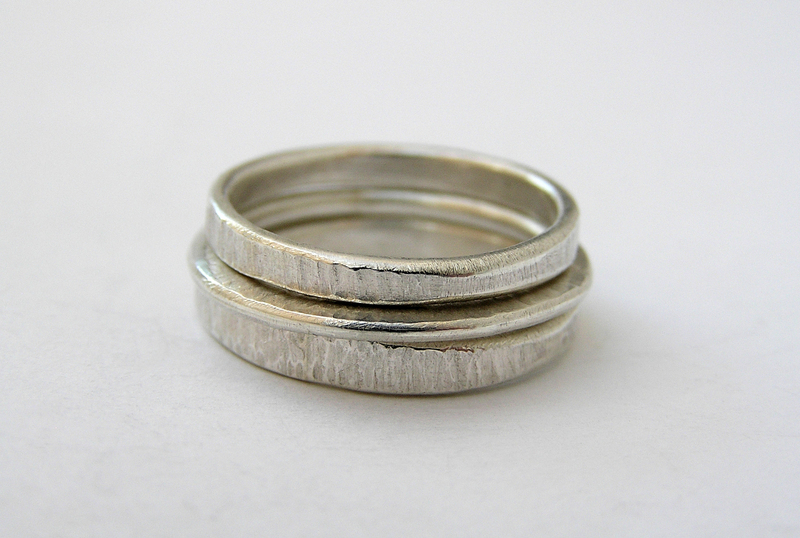 Worn with plain stacking band. 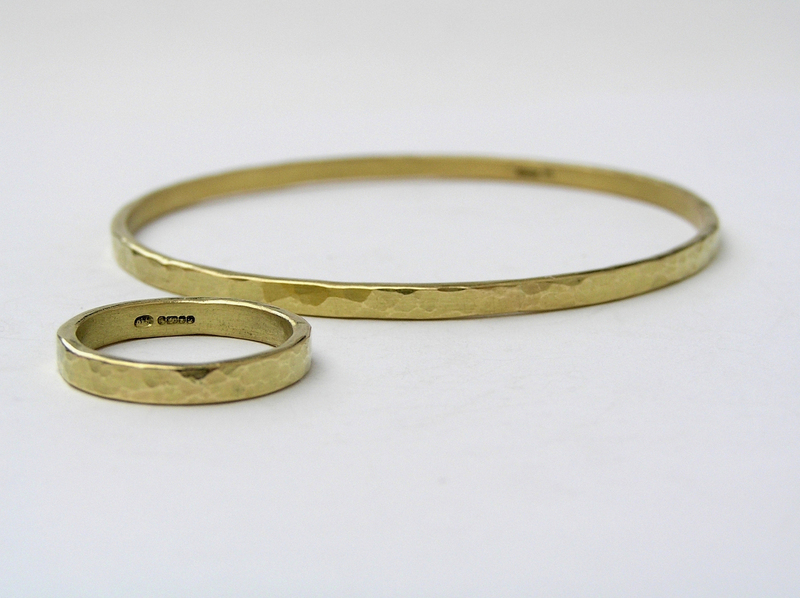 Total overall width of bands approx 7mm. 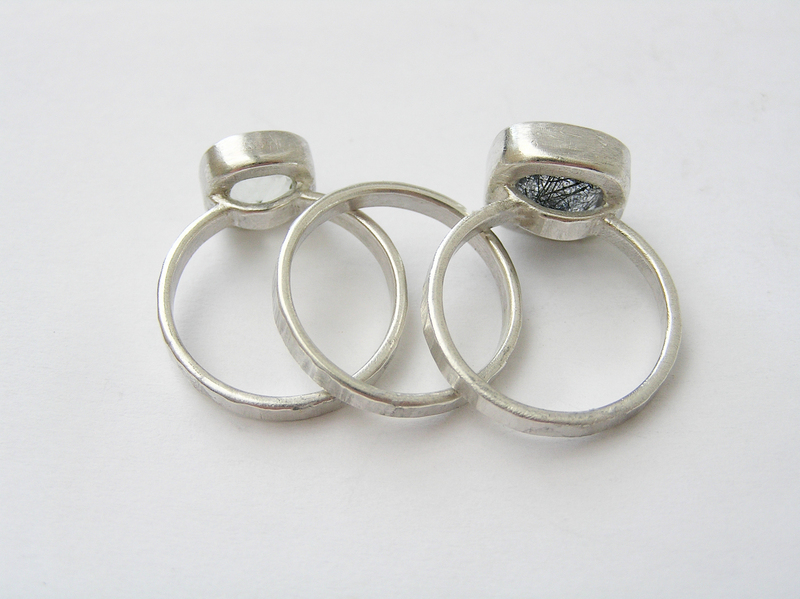 Set of 3 rings approx 7mm total width, set of 5 rings approx 11mm total width. 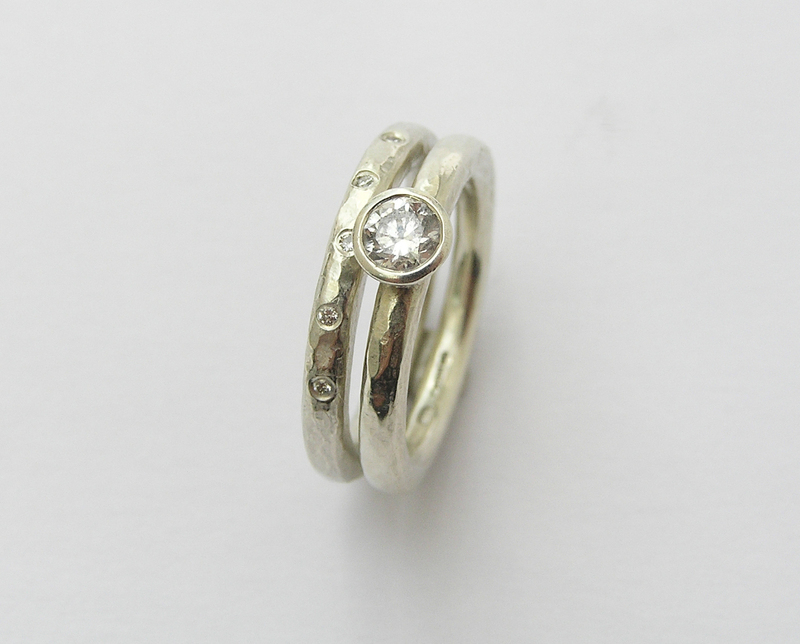 Band approx 4.5-5mm wide, with 6x 1mm scatter diamonds. 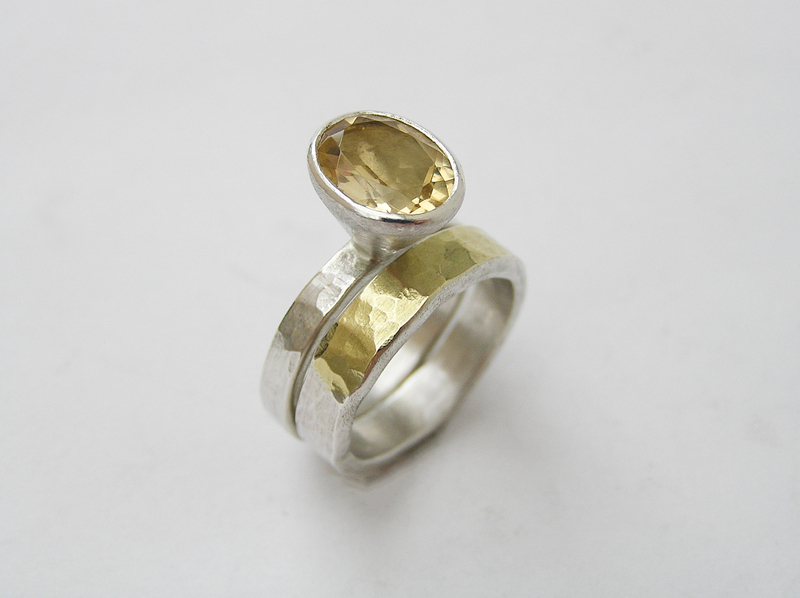 Shank approx 3mm wide, stone 10x8mm Citrine, setting sits approx 7-8mm high. 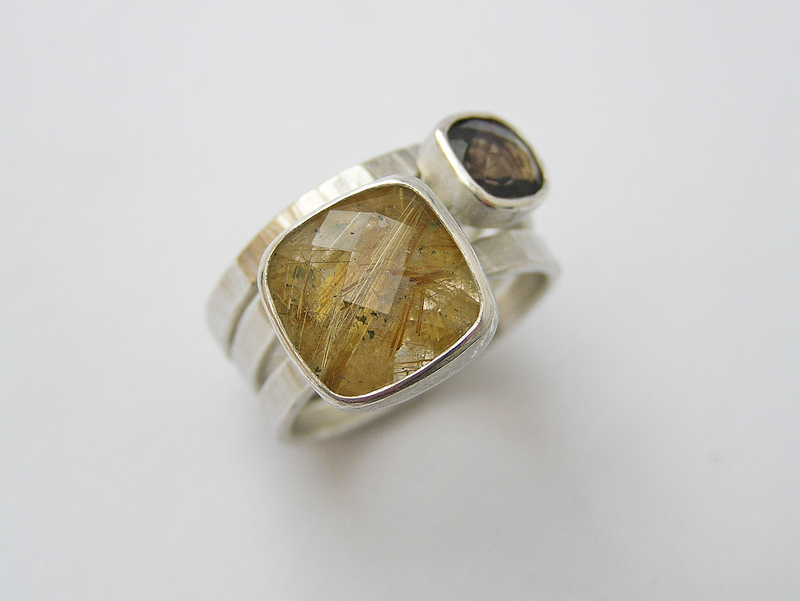 Stone shown is 10x8mm Citrine. 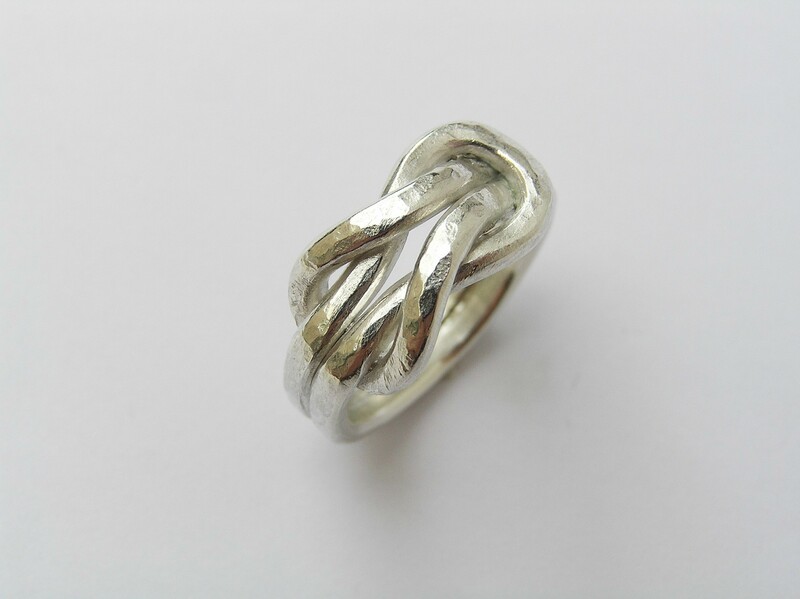 Band approx 2mm diameter, swirl approx 4mm diameter at widest point. 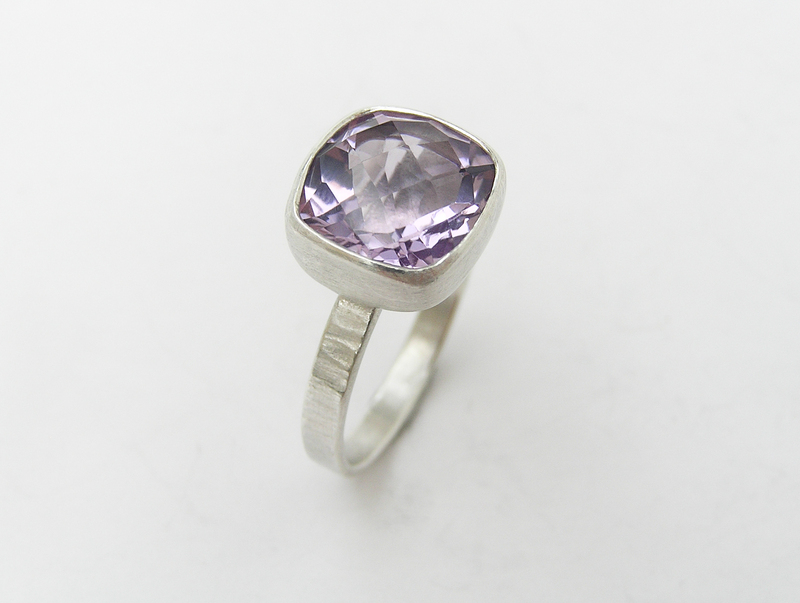 Stone shown is 10x10mm Amethyst. 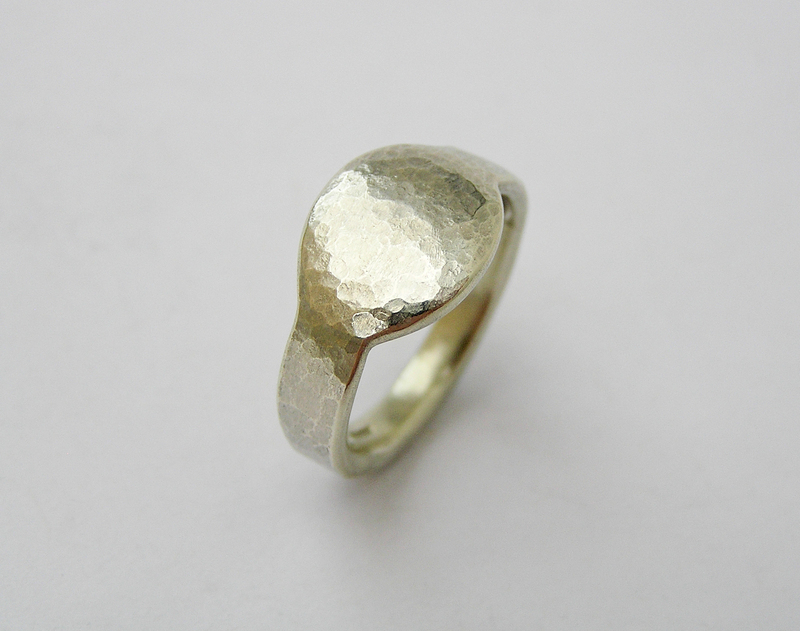 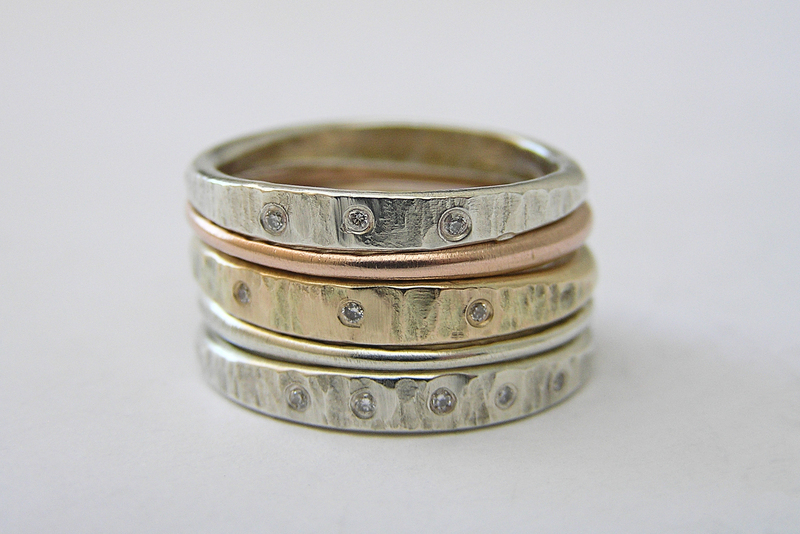 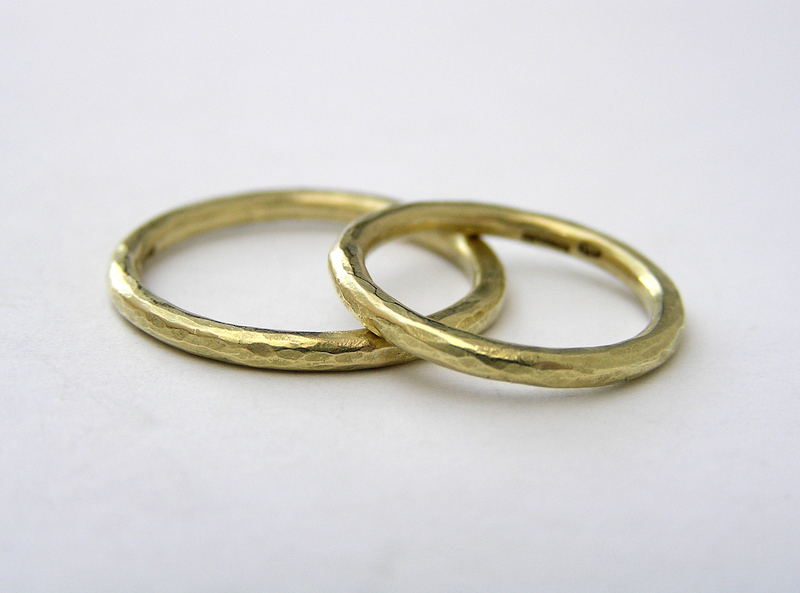 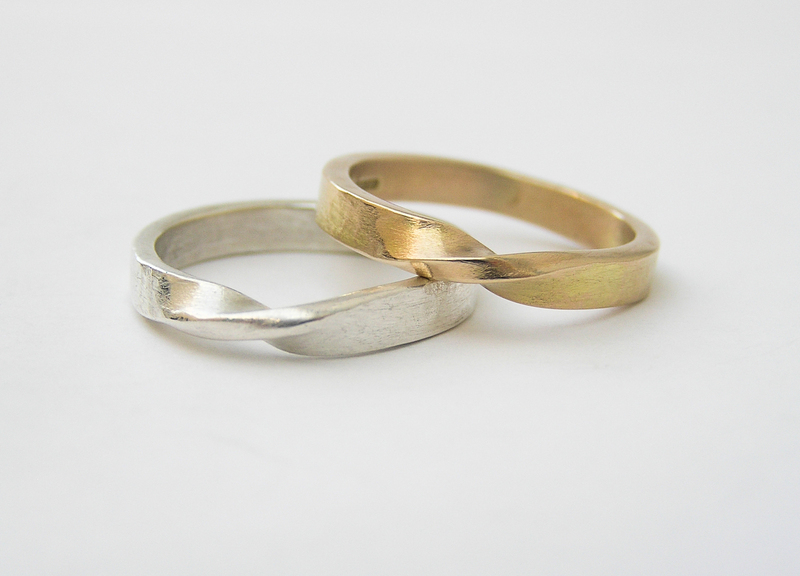 Two Dappled rings shown stacked together. 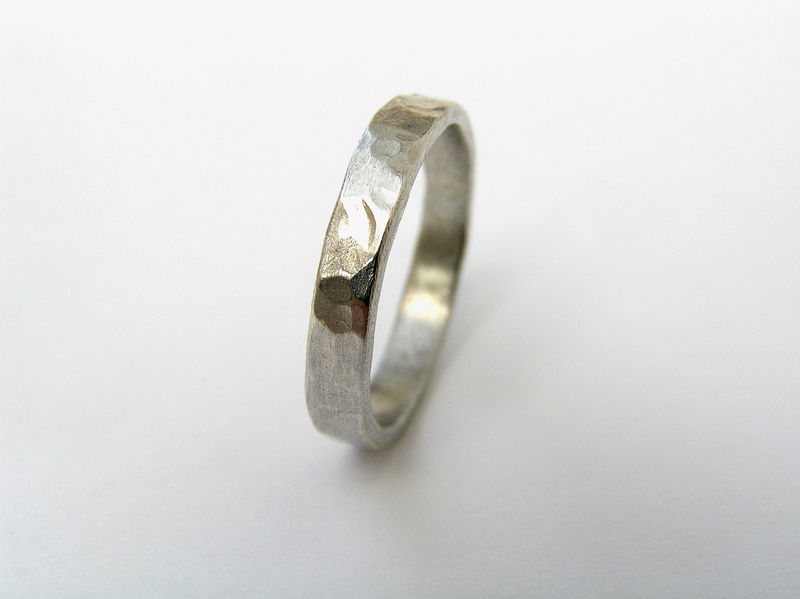 Overall width approx 8mm. 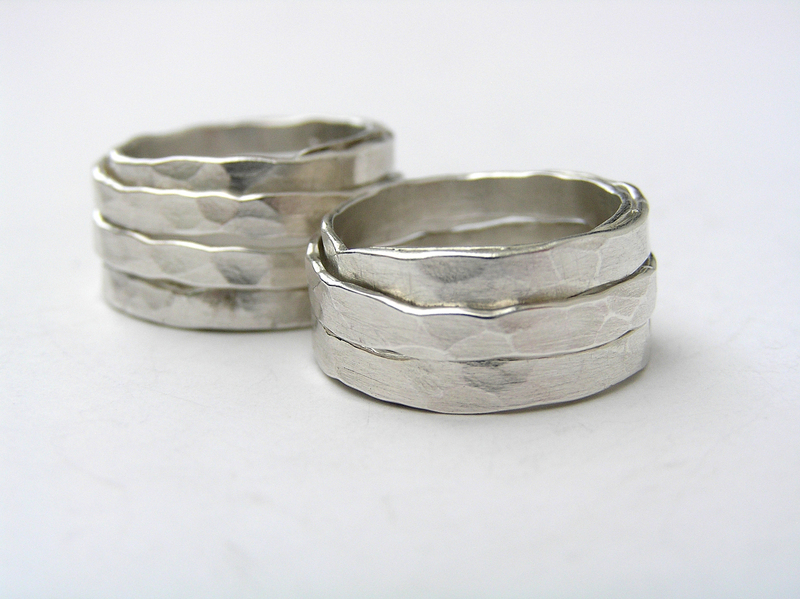 Slim band approx 3mm wide, wide band approx 4.5-5mm wide. 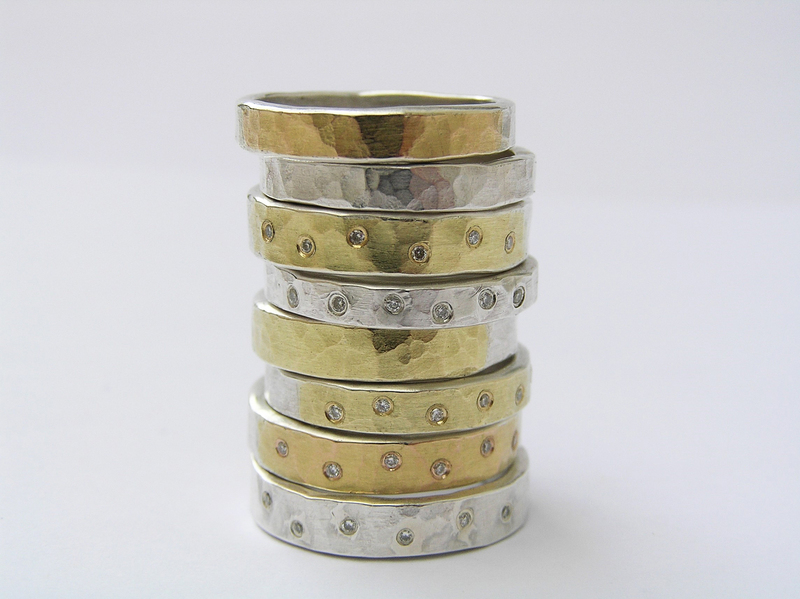 Various combinations of silver and/or gold, with or without scatter diamonds, available on request. 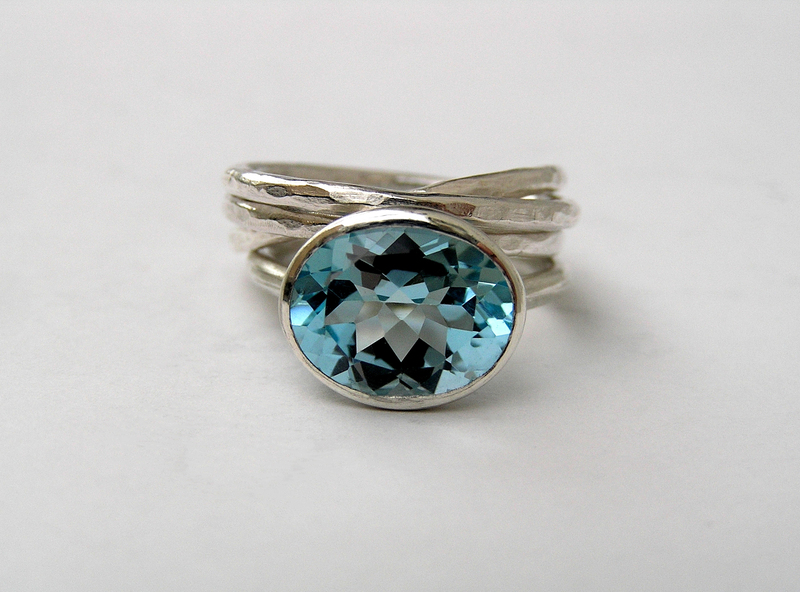 Plain band (top), stacked with (middle) 8x8mm Blue Topaz and (bottom) 6x6mm Rock Crystal. 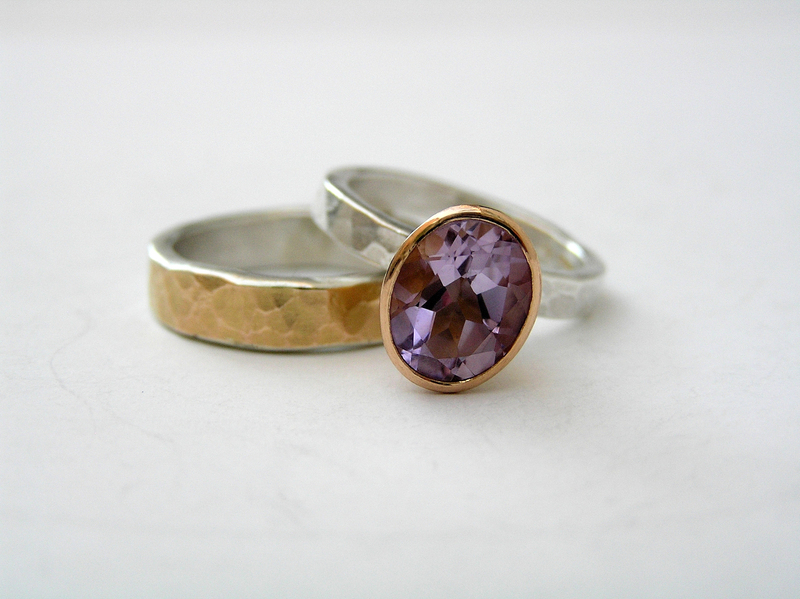 (Top) 8x8mm Amethyst, (bottom) 10x10mm Tourmalated Quartz. 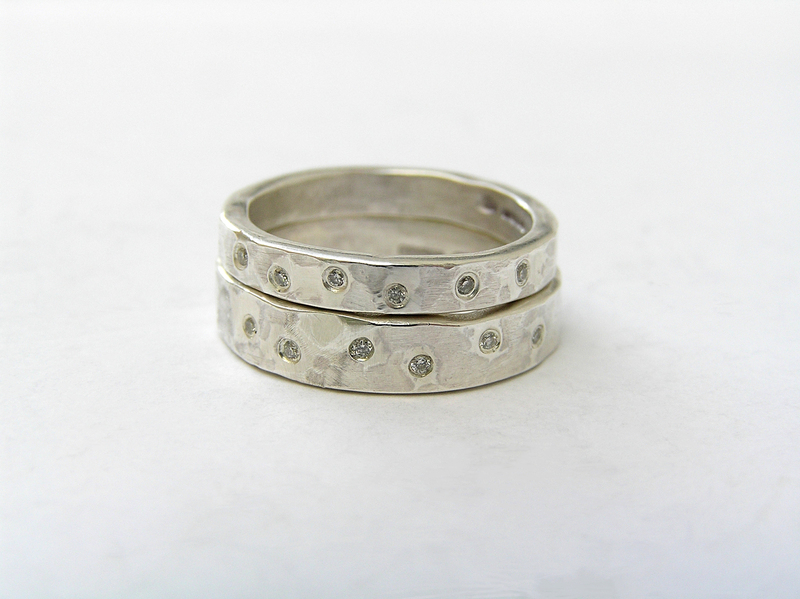 Worn with plain stacking band. 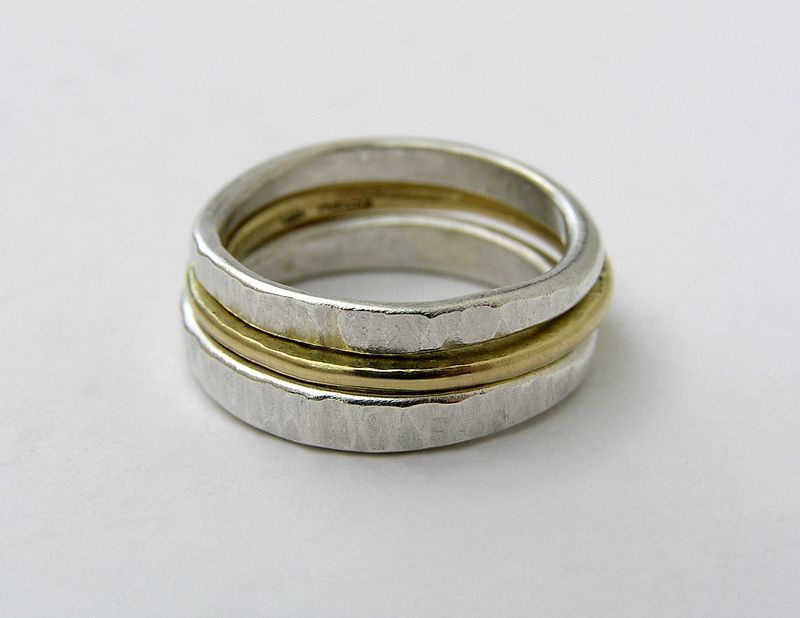 Total overall width of bands approx 7mm. 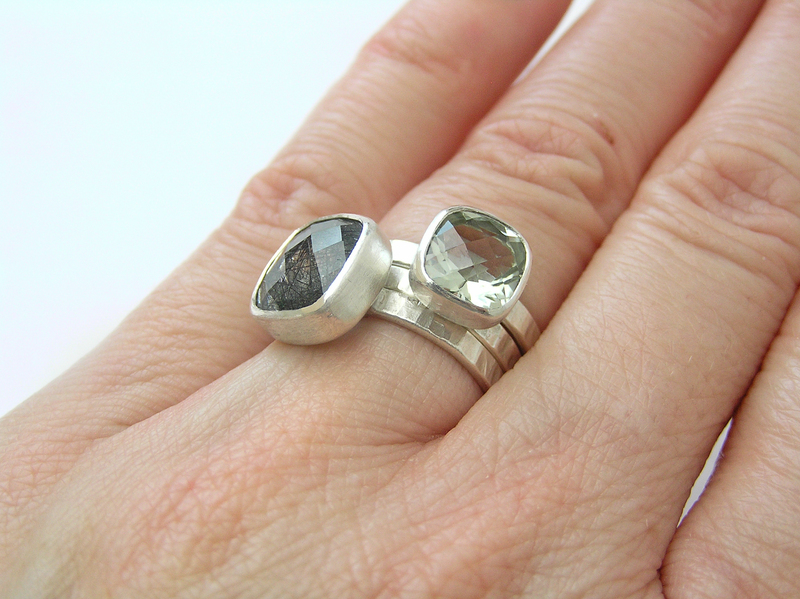 Lustre stacking rings 10mm Rutilated Quartz, 6mm Smoky Quartz and plain stacking band. 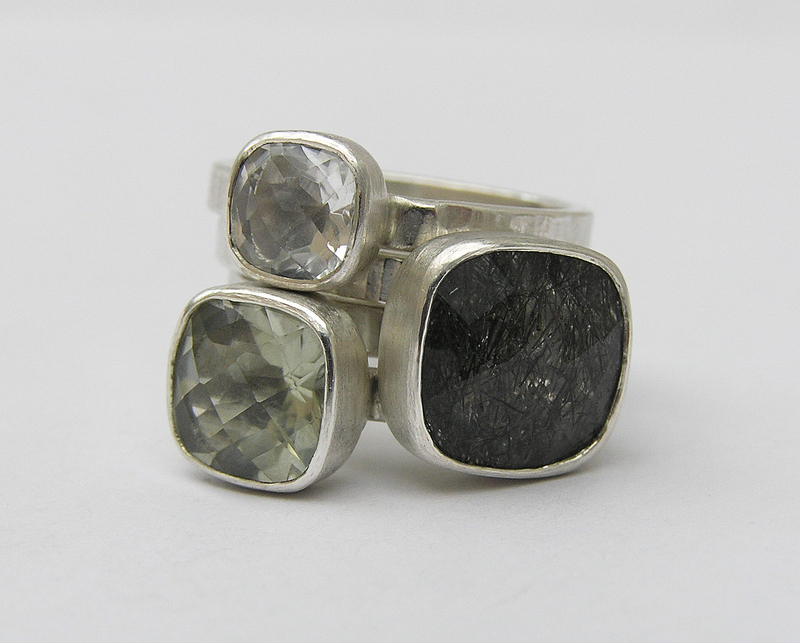 (Top to bottom) plain band, 6x6mm Smoky Quartz, 10x10mm Rutilated Quartz. 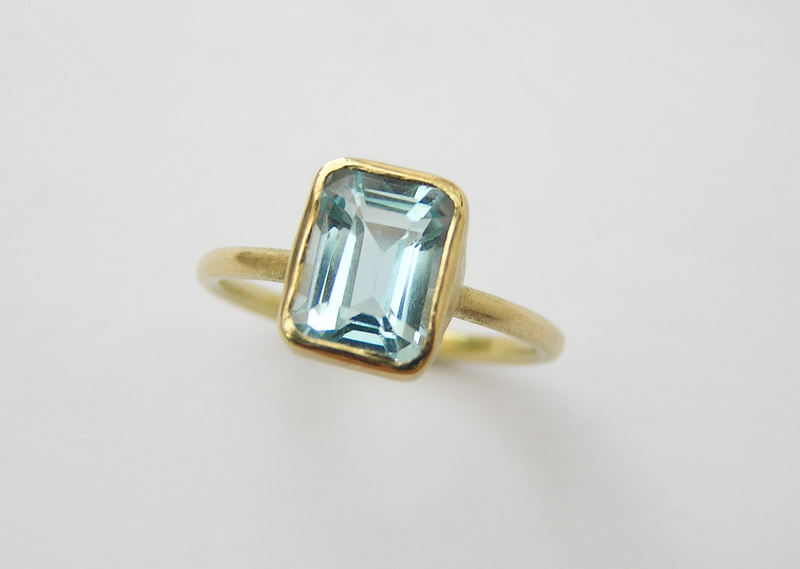 8x8mm Blue Topaz, worn with two plain stacking bands. 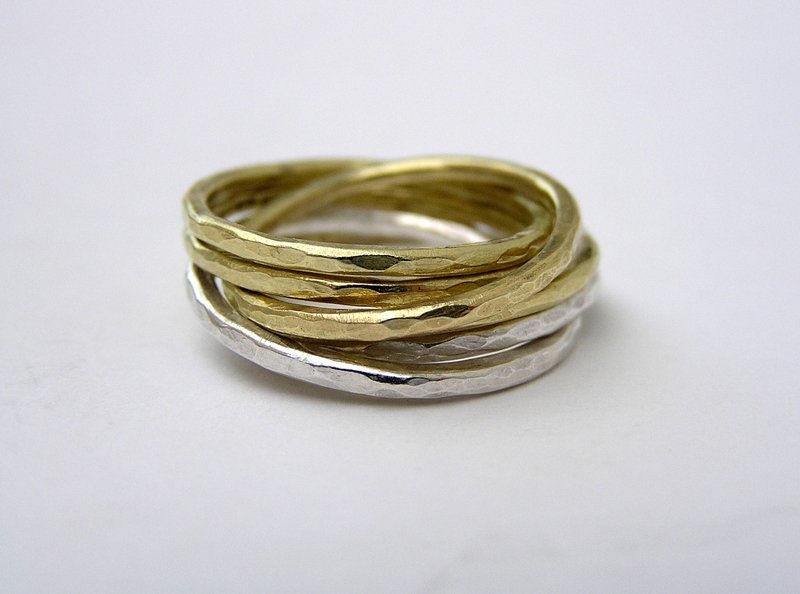 Total overall width of bands approx 7mm. 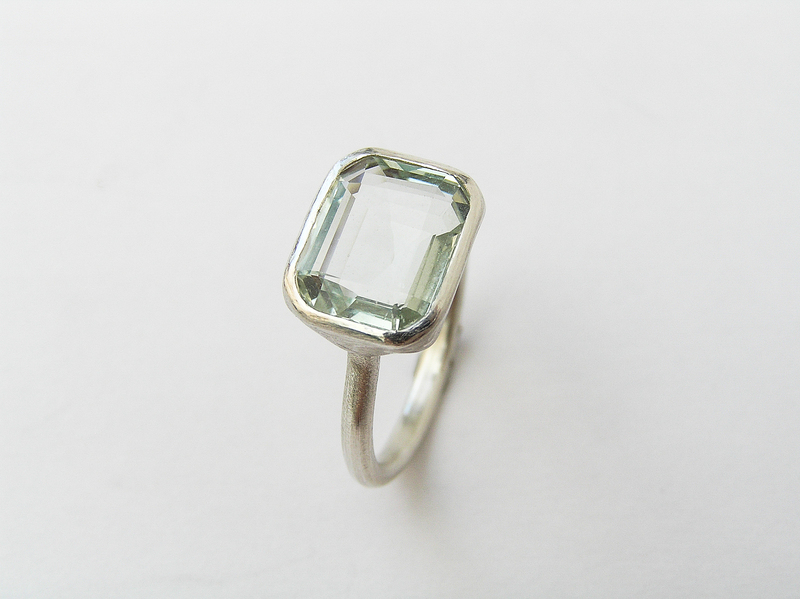 (Top to bottom) 6x6mm Rock Crystal, plain band, 10x10mm Tourmalated Quartz, 8x8mm Green Quartz. 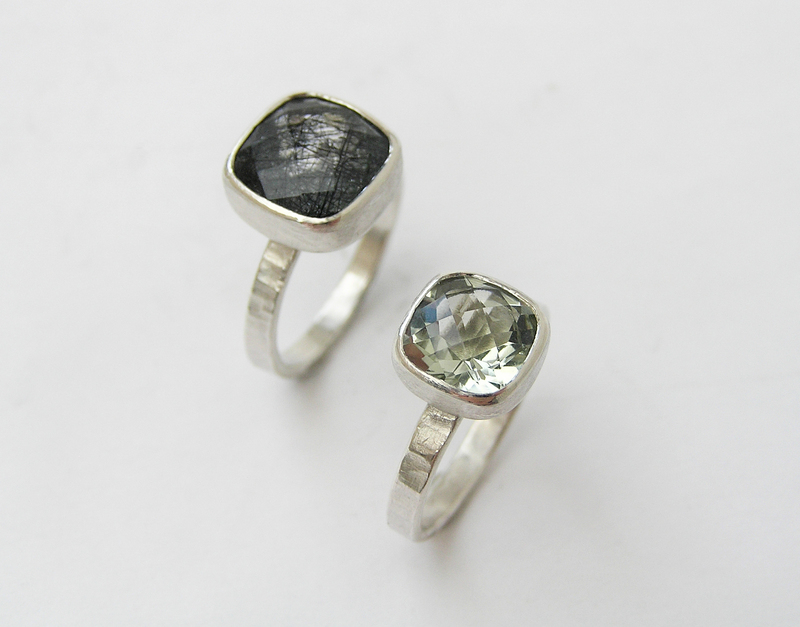 (Left) 10x10mm Tourmalated Quartz, (right) 8x8mm Green Quartz. 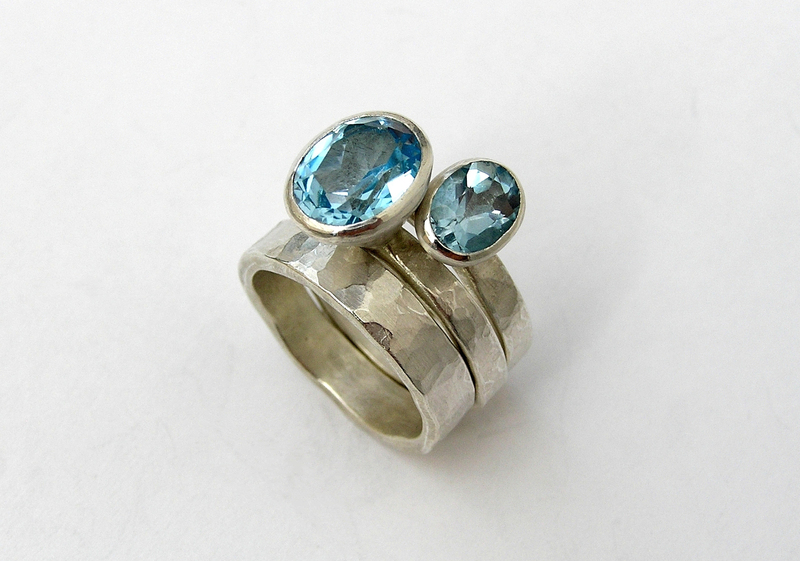 8x8mm and 10x10mm Blue Topaz, worn with plain stacking band. 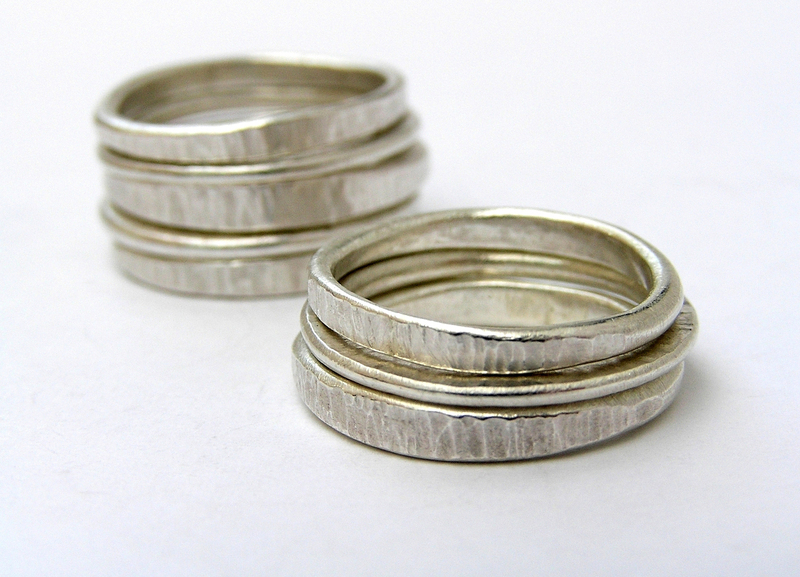 Total overall width of bands approx 7mm. 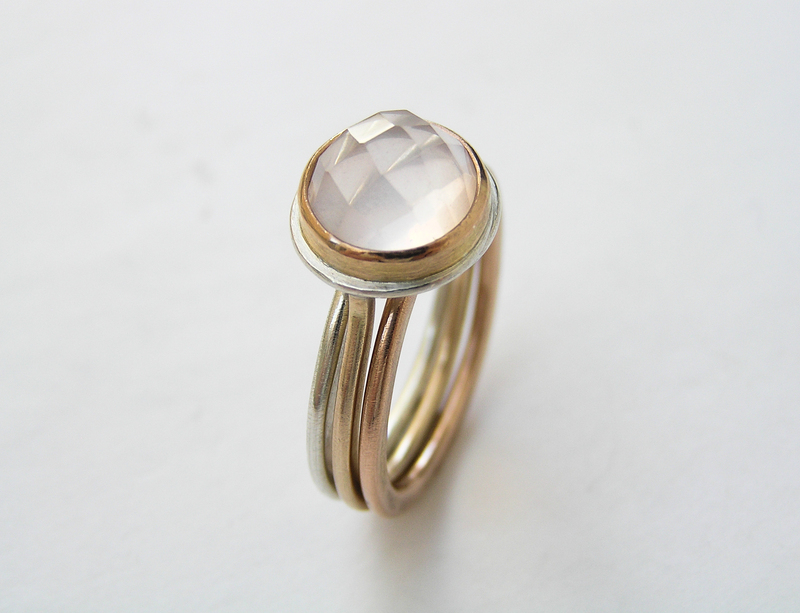 (Top to bottom) plain band, 6x6mm Rock Crystal, 10x10mm Tourmalated Quartz. 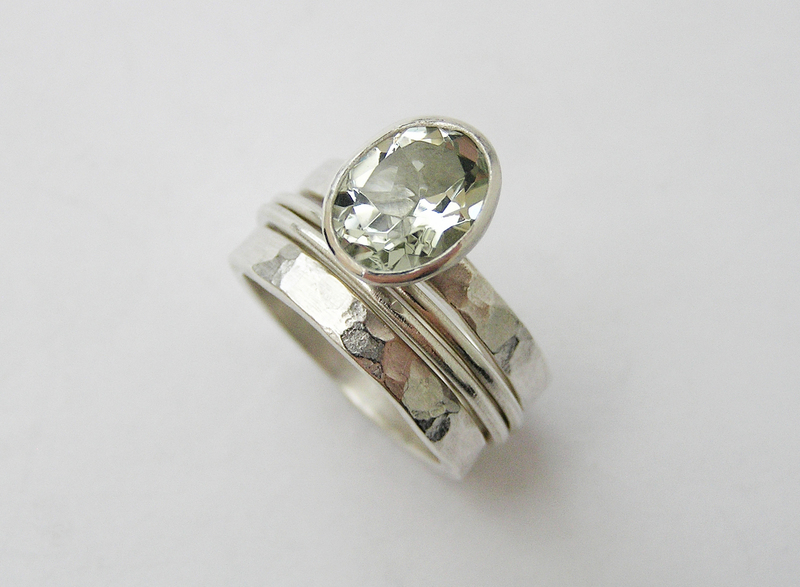 (Left to right) 8x8mm Green Quartz, plain band,10x10mm Tourmalated Quartz. 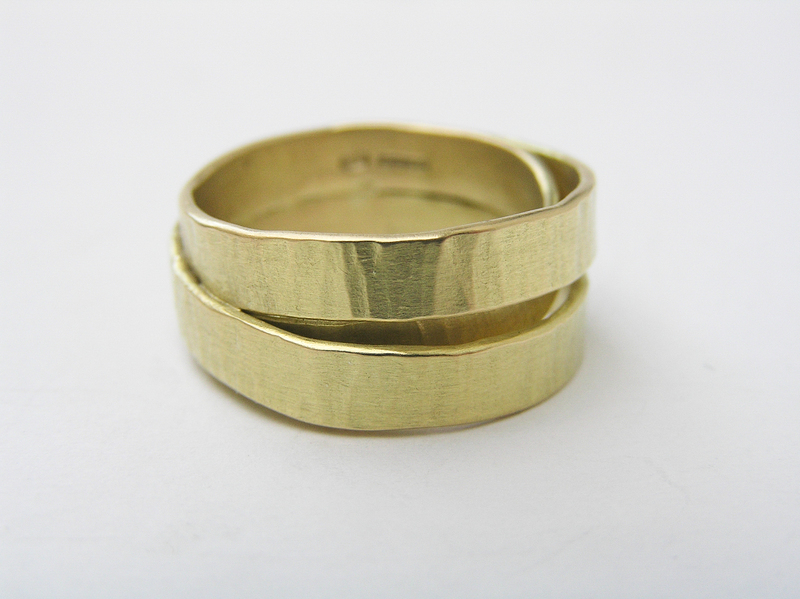 Total overall width of bands approx 7mm. 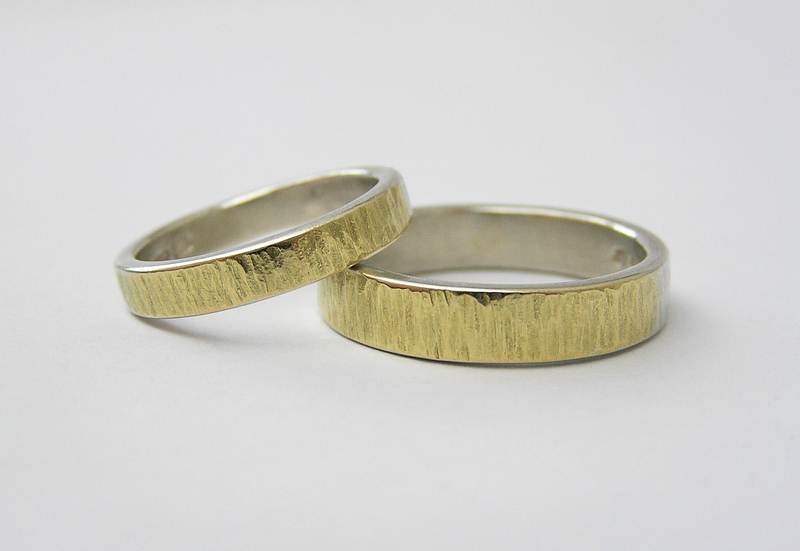 Slim band is approx 3mm wide, wide band is approx 5mm wide. 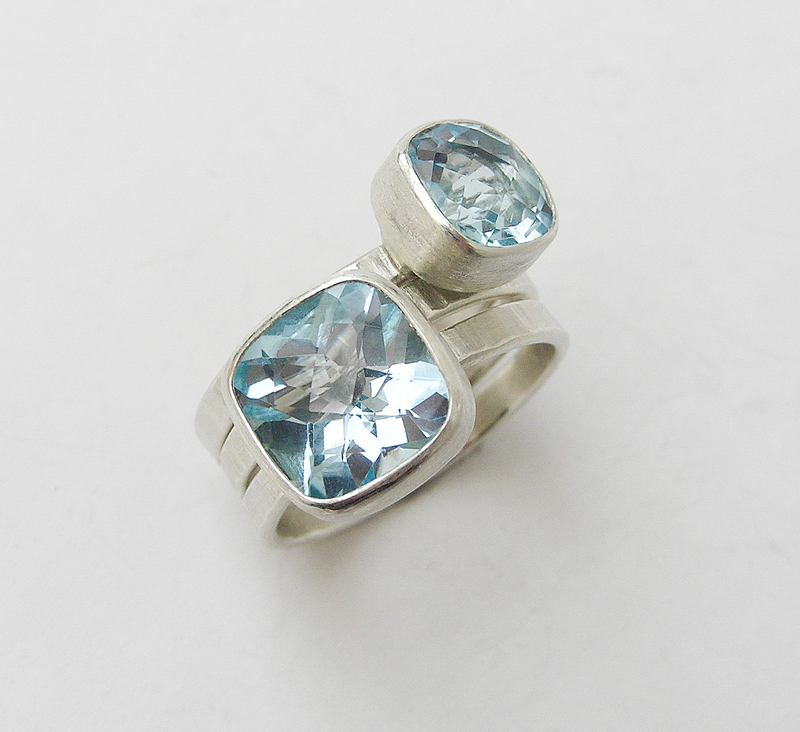 Stone sizes - Diamond 4.5mm, London Blue Topaz 5mm, Sky Blue Topaz 6mm. 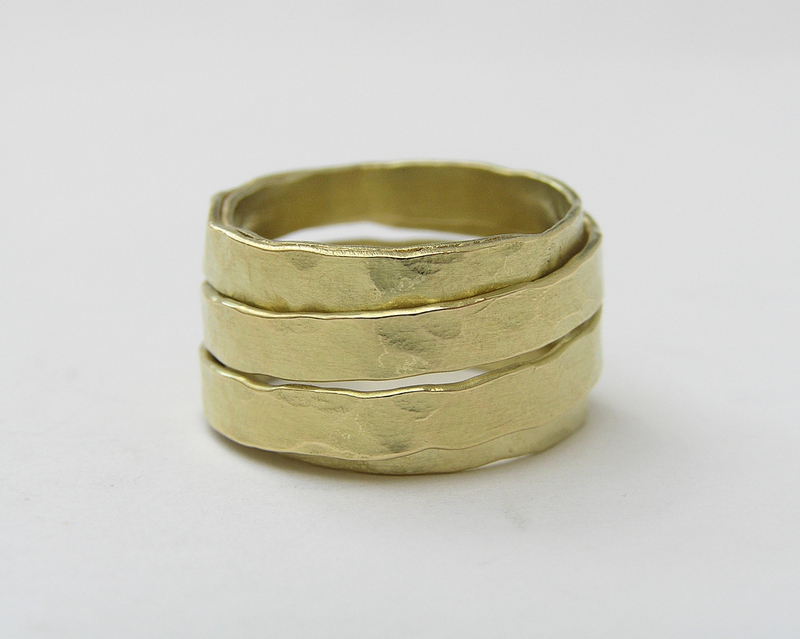 Slim ring (front) approx 10mm wide, standard ring (back) approx 14mm wide. 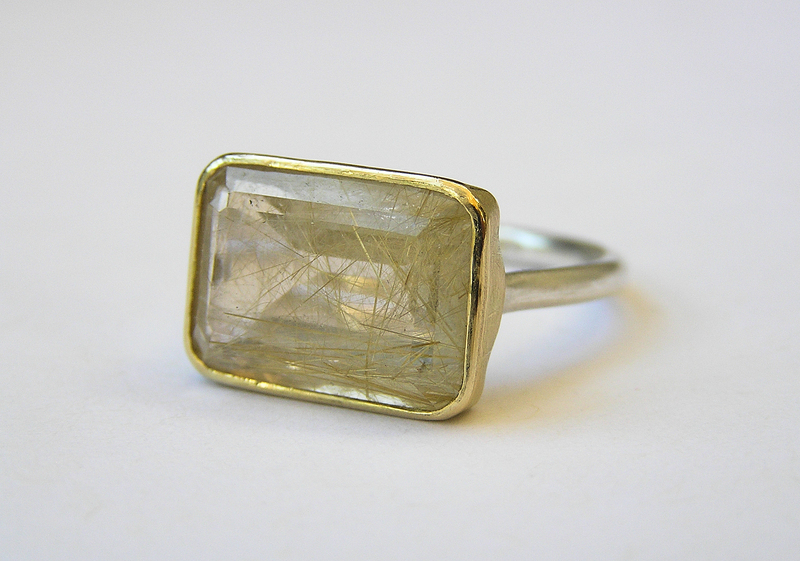 Stone shown is 14x10mm Green Quartz. 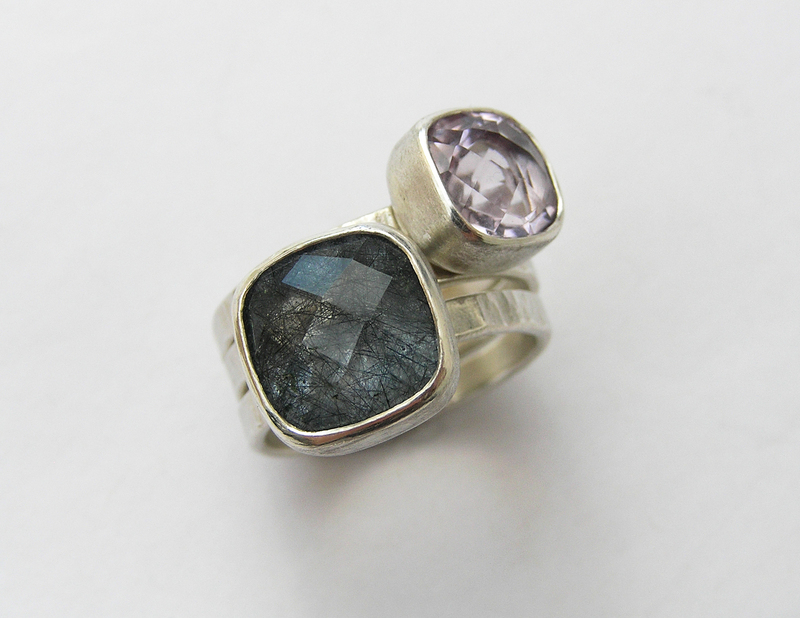 Stones shown are 10x8mm Blue Topaz (front), and Amethyst (back). 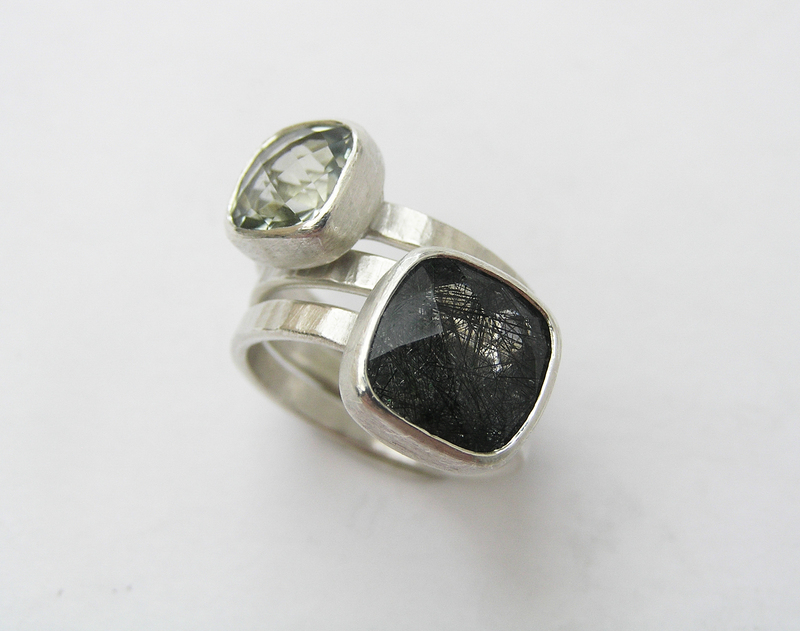 Stones shown are 11x9mm (rectangular) and 10x8mm (oval) Green Quartz. 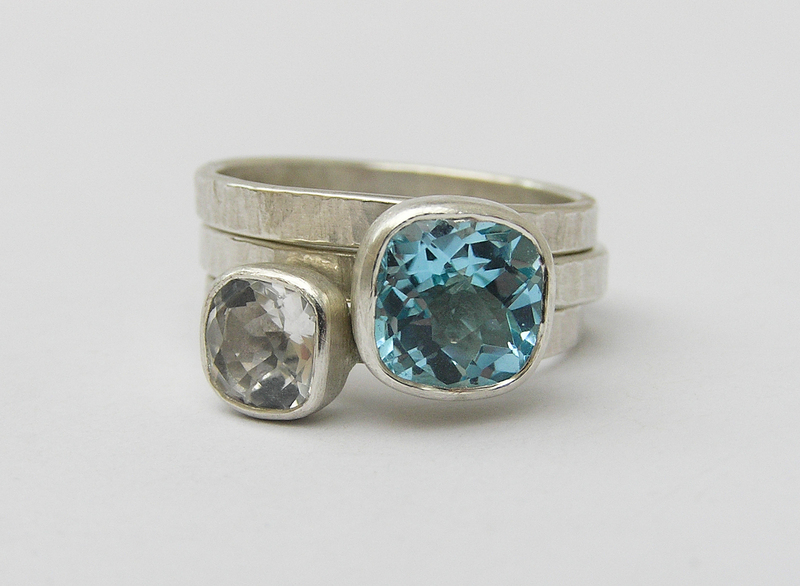 Stones shown are 12x10mm Blue Topaz (front) and 10x8mm Ctrine (back). 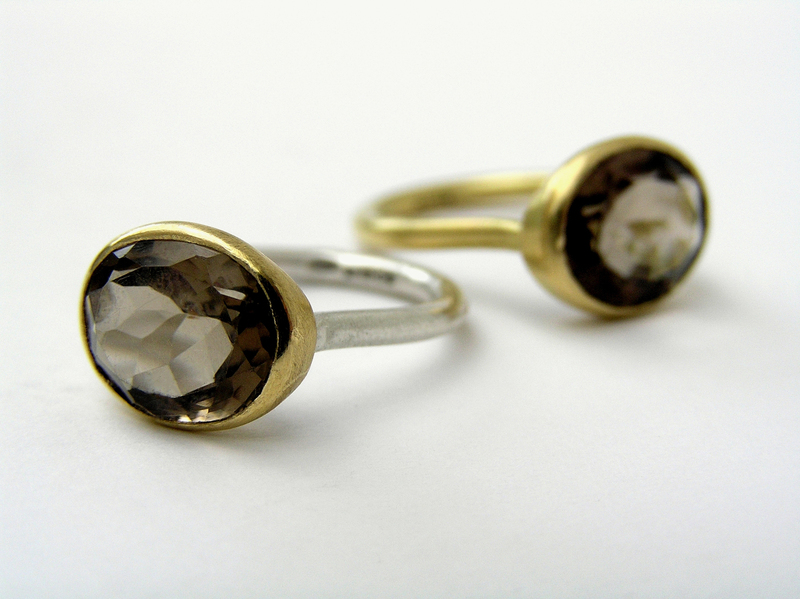 Stones shown are 12x10mm Smoky Quartz. 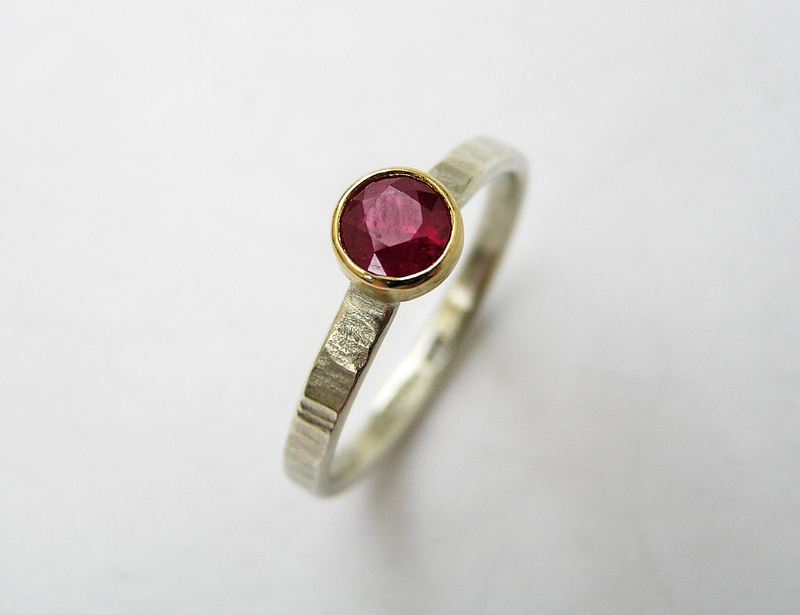 Set with customer's own stone, size approx 8x6mm. 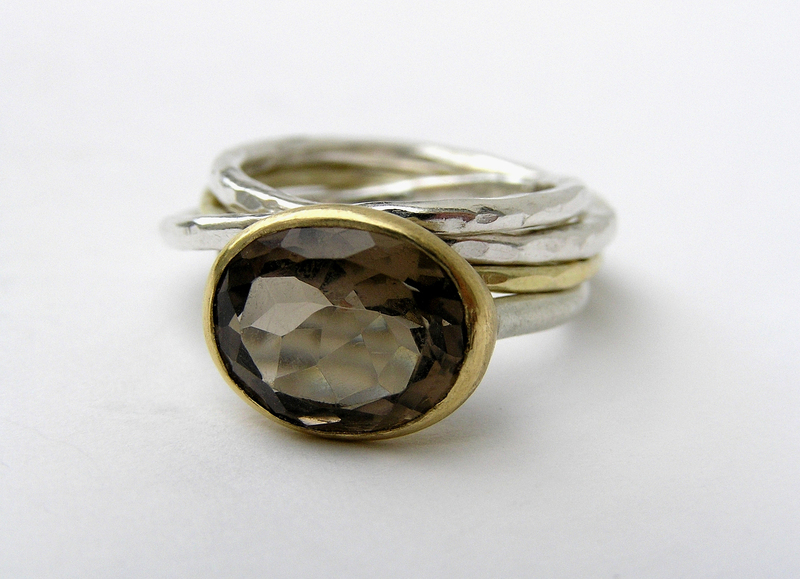 Gem ring with 12x10mm Smoky Quartz stacked with silver and 18ct gold Dappled ring. 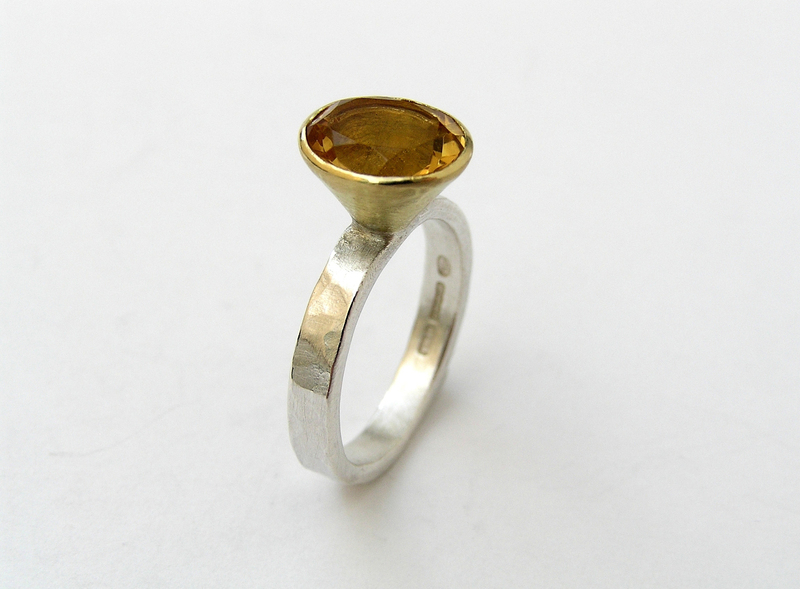 Gem ring with 12x10mm Citrine stacked with silver and 18ct gold Dappled ring. 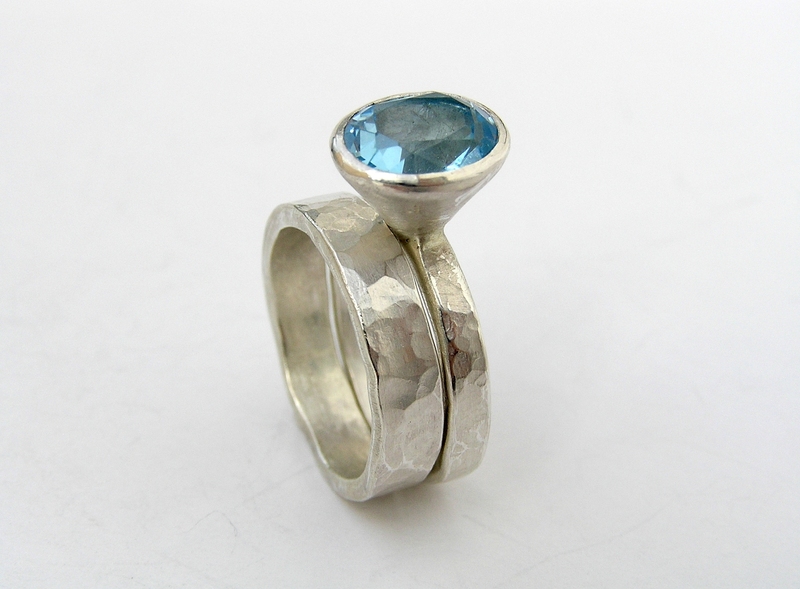 Gem ring with 12x10mm Blue Topaz stacked with silver Dappled ring. 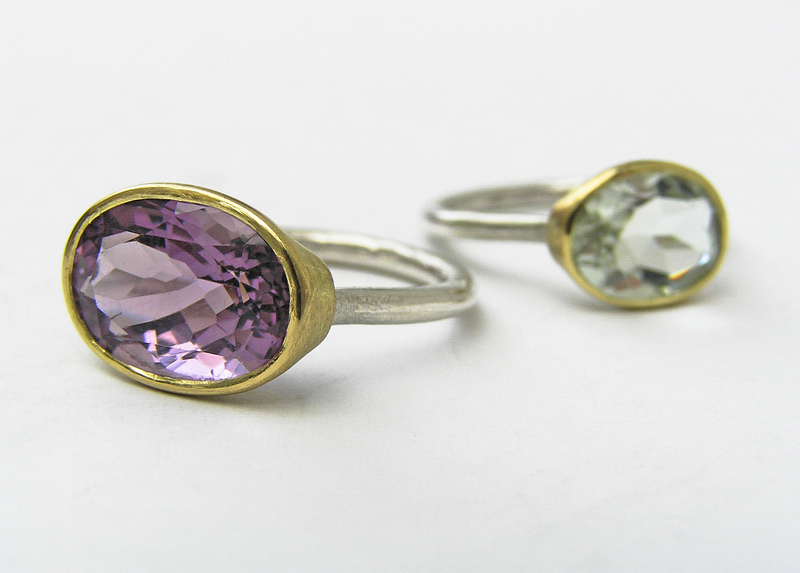 Stone set ring - shank approx 3mm wide, stone 10x8mm Amethyst, setting sits approx 7-8mm high. 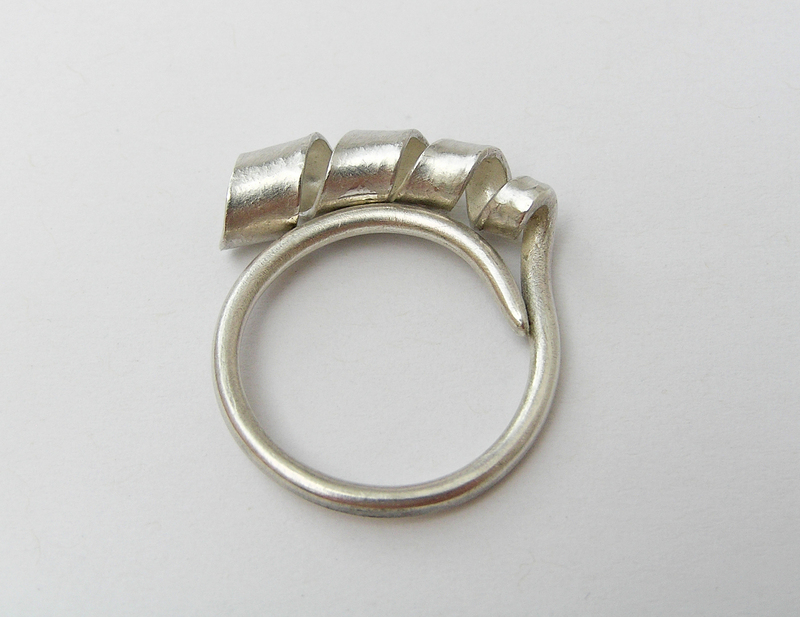 Shown with wide ring,approx 4.5-5mm wide. 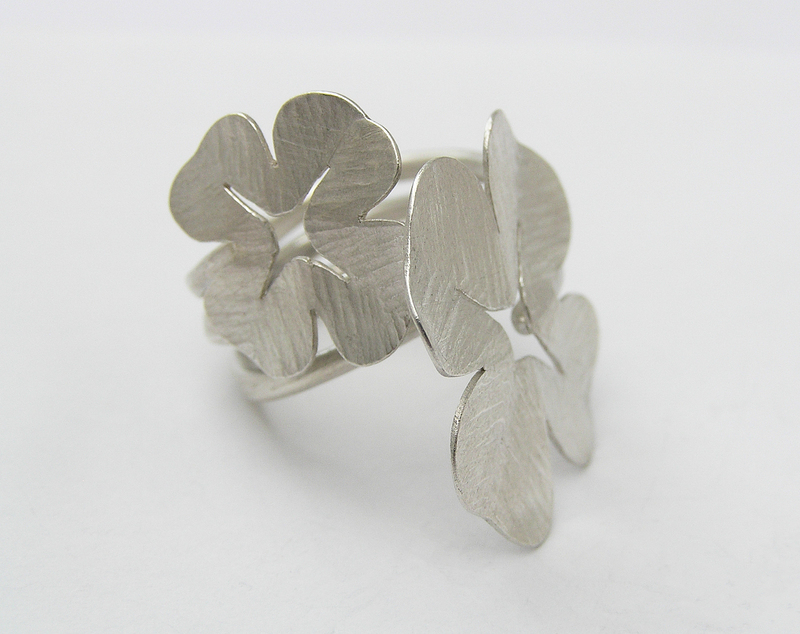 Small clover approx 1.5cm across, large clover approx 2.3cm across. 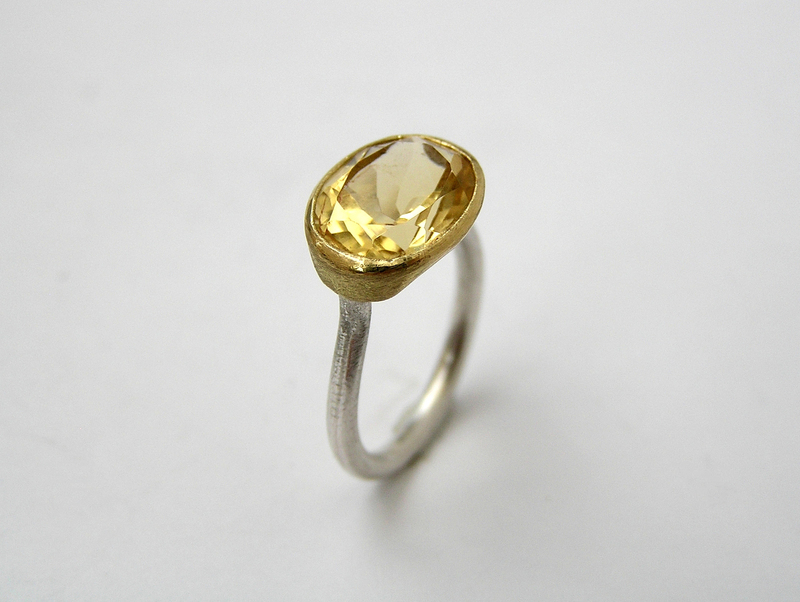 Stone set ring - shank approx 3mm wide, stone 10x8mm Citrine, setting sits approx 7-8mm high. 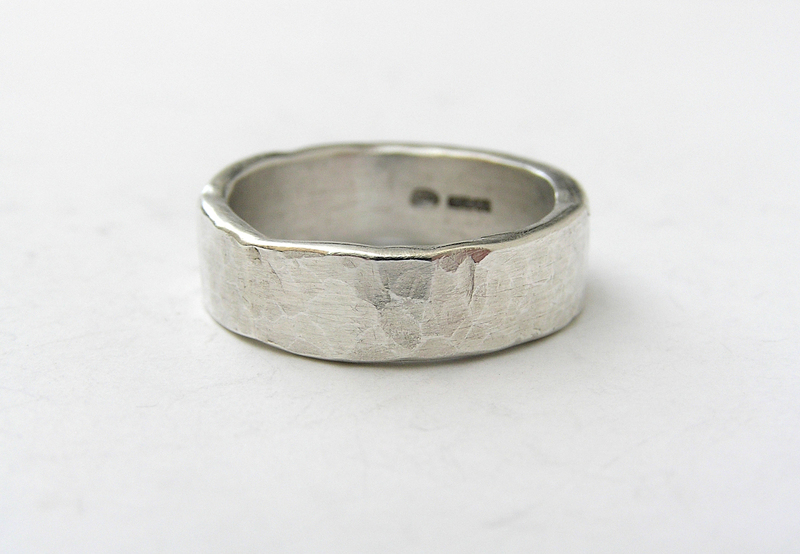 Worn with wide ring, approx 4.5-5mm wide. 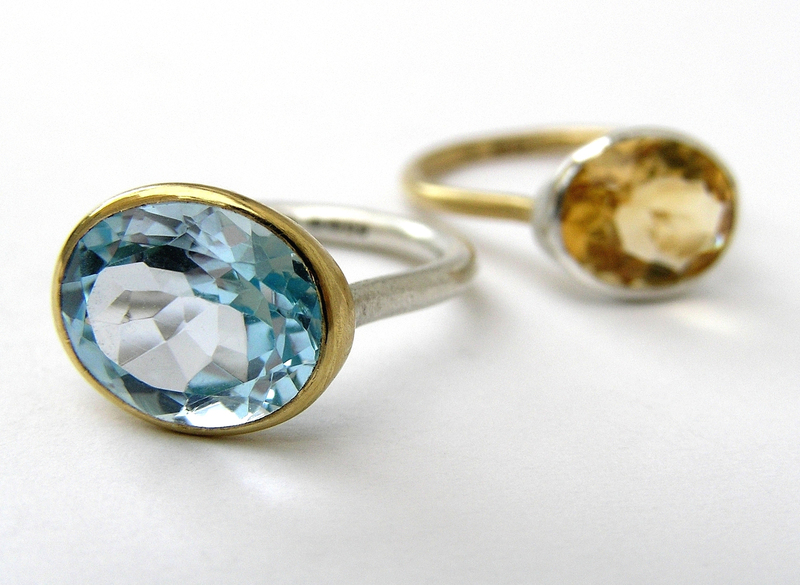 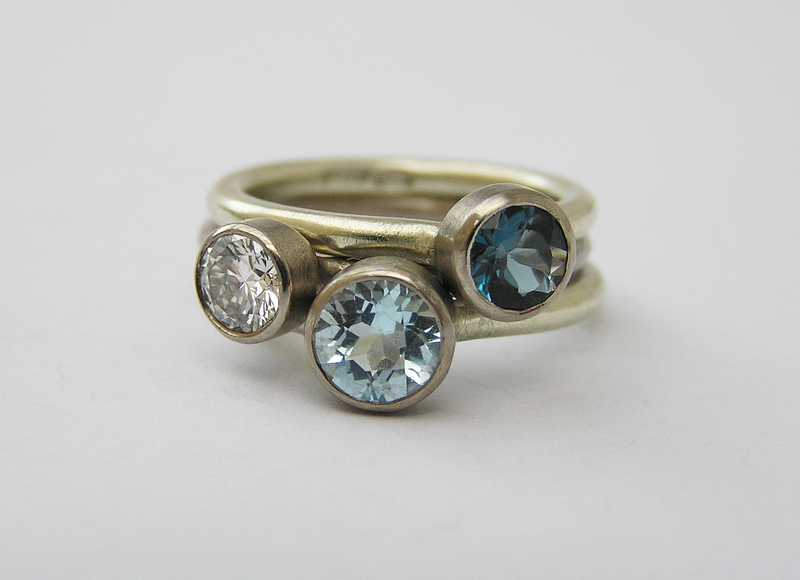 Stone set rings - shank approx 3mm wide, (back) 8x6mm and (middle) 10x8mm Blue Topaz. 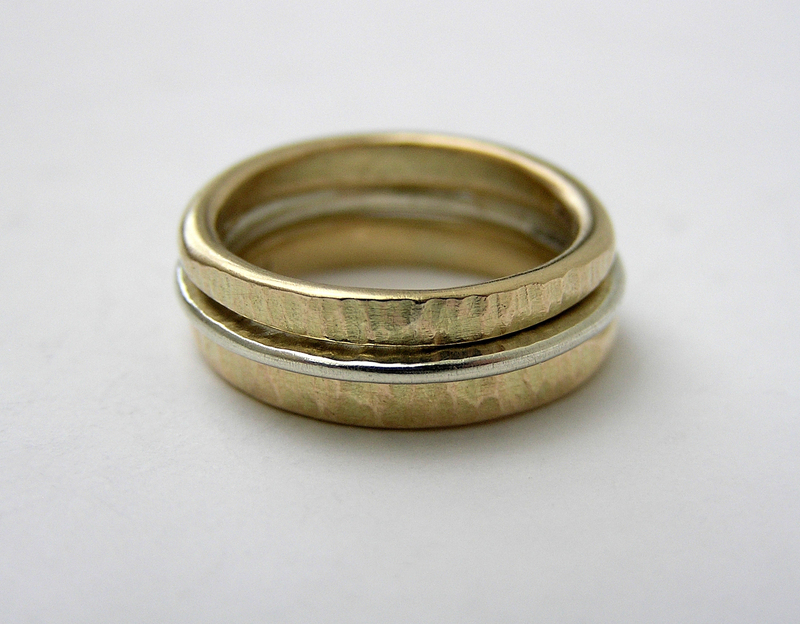 Worn with wide ring,approx 4.5-5 mm wide. 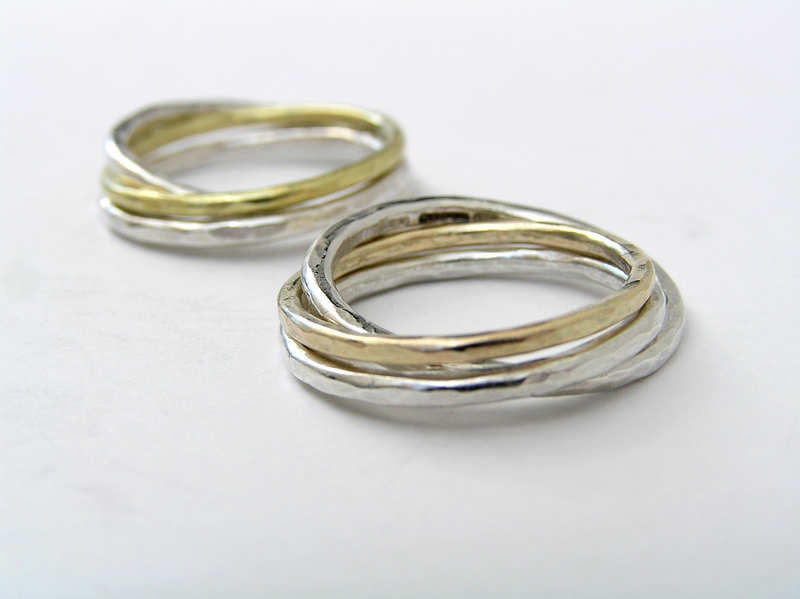 Slim band approx 3mm wide, wide band approx 4.5-5mm wide. 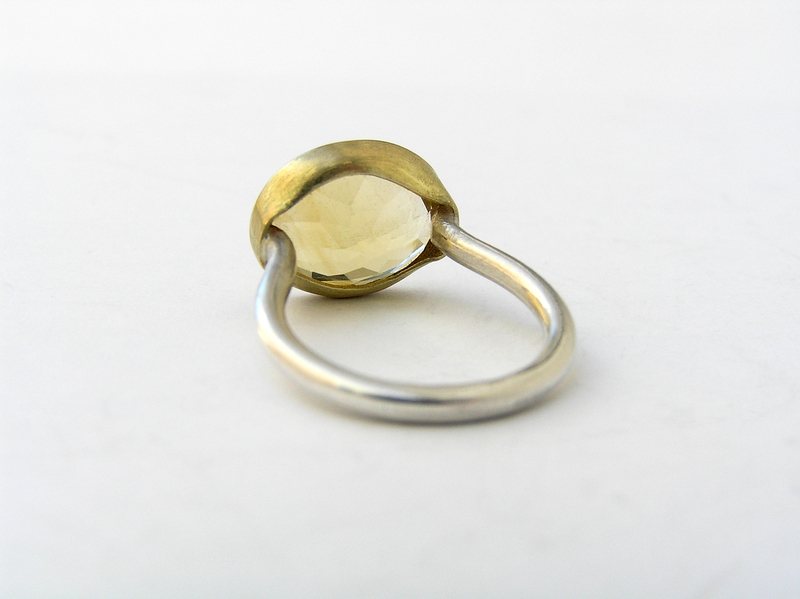 Stone set ring - shank approx 3mm wide, stone 10x8mm Green Quartz, setting sits approx 7-8mm high. 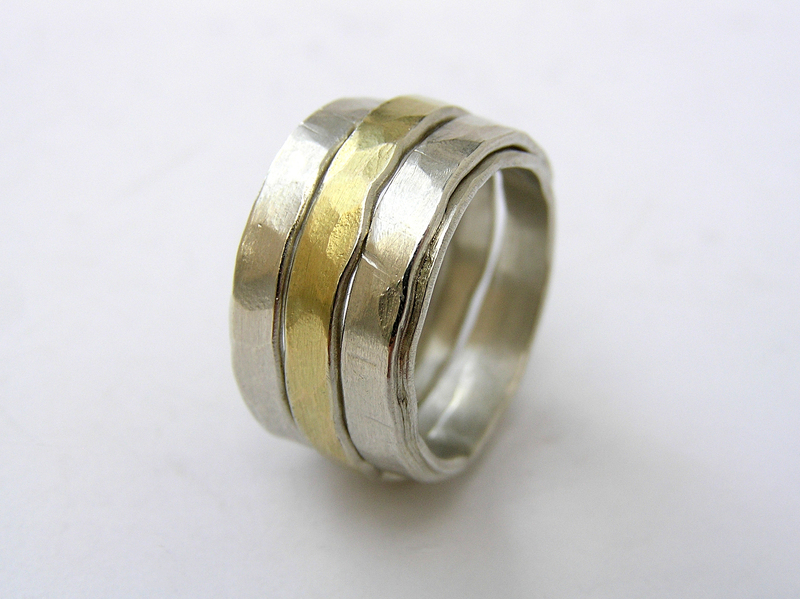 Stacked with pair of Layers bands, and Dimpled slim ring, approx 3mm wide. 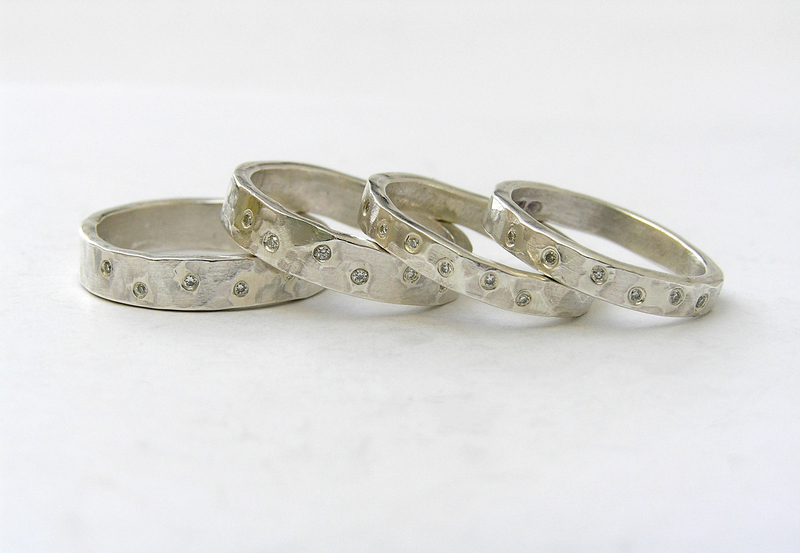 Slim bands approx 3mm wide, wide bands approx 4.5-5mm wide, each set with 6x 1mm scatter stones. 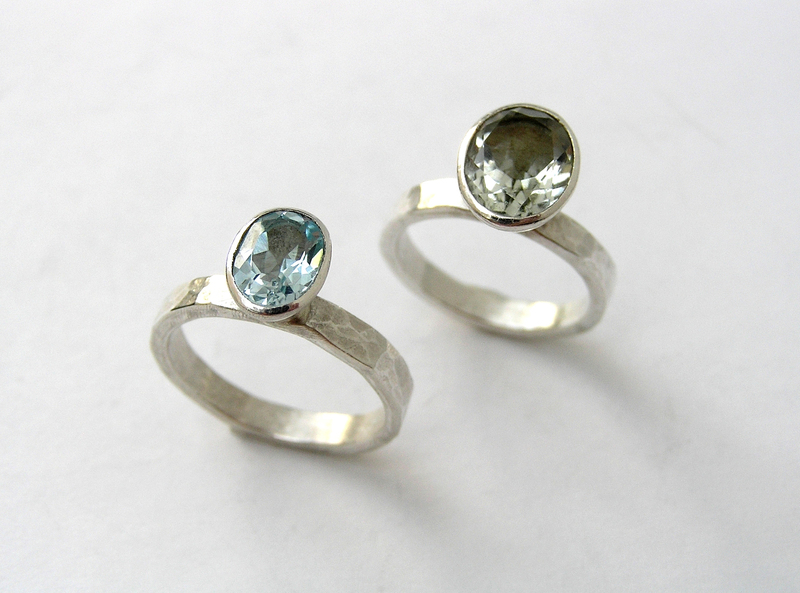 Stone set rings - shank approx 3mm wide, (front) 8x6mm Blue Topaz and (back) 10x8mm Green Quartz. 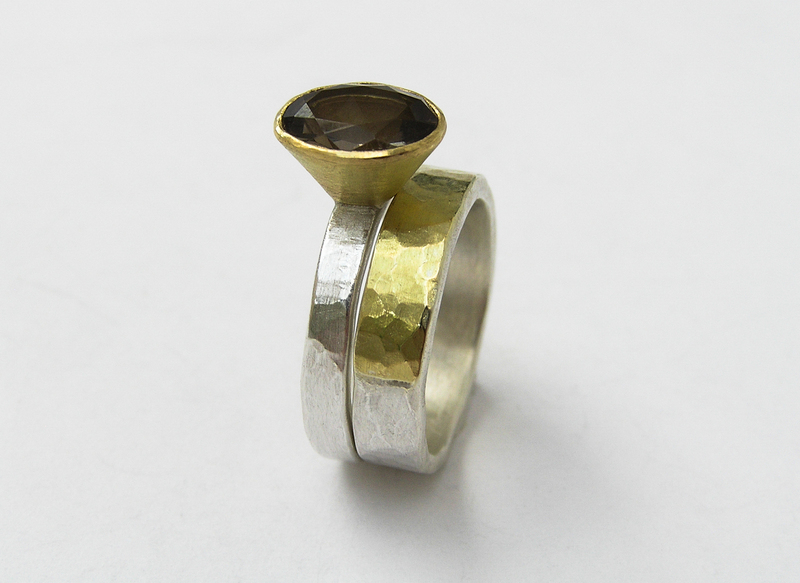 Stone set ring - shank approx 3mm wide, stone 10x8mm Smoky Quartz, setting sits approx 7-8mm high. 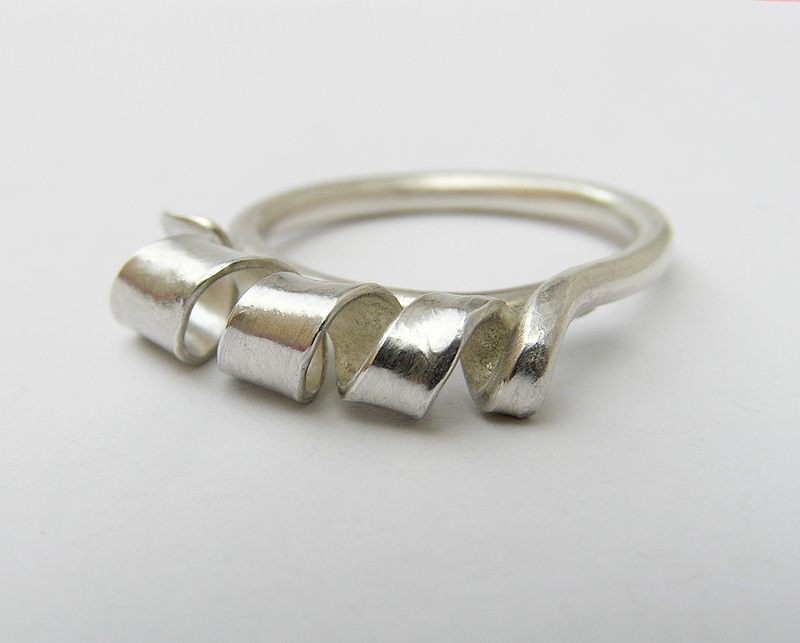 Shown with wide ring,approx 4.5-5mm wide. 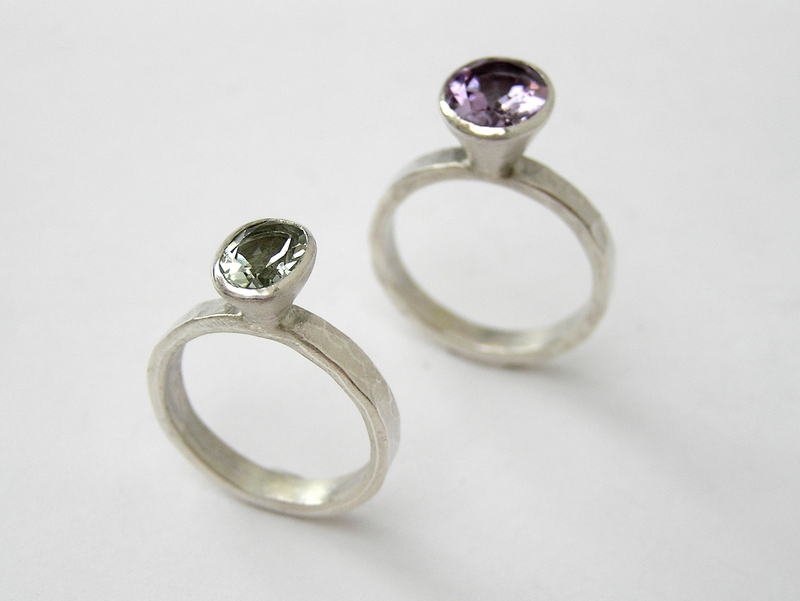 Stone set rings - shank approx 3mm wide, (front) 8x6mm Green Quartz and (back) 10x8mm Amethyst. 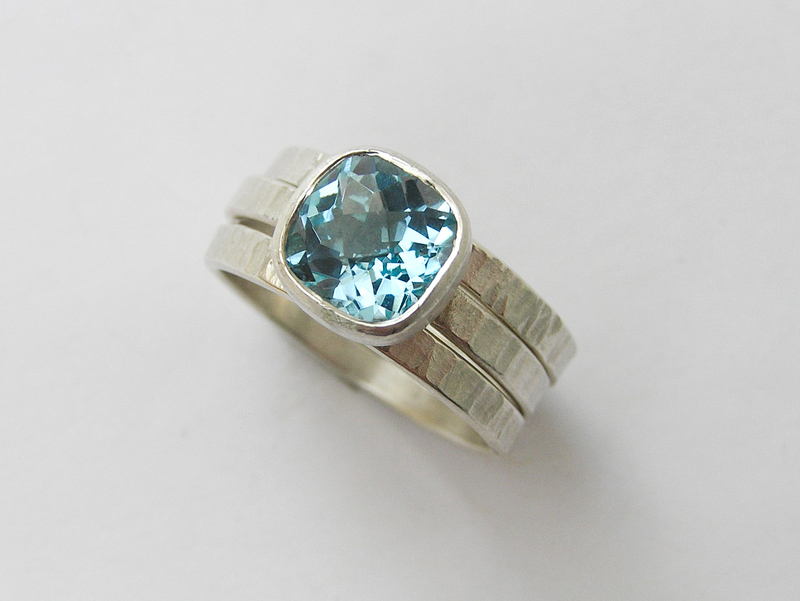 Stone set ring - shank approx 3mm wide, stone 10x8mm Blue Topaz, setting sits approx 7-8mm high. 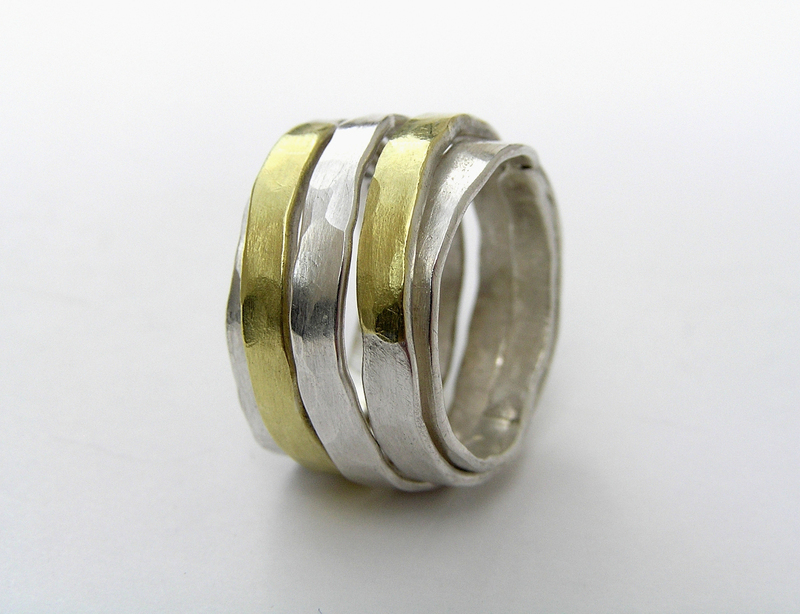 Shown with wide ring,approx 4.5-5mm wide. 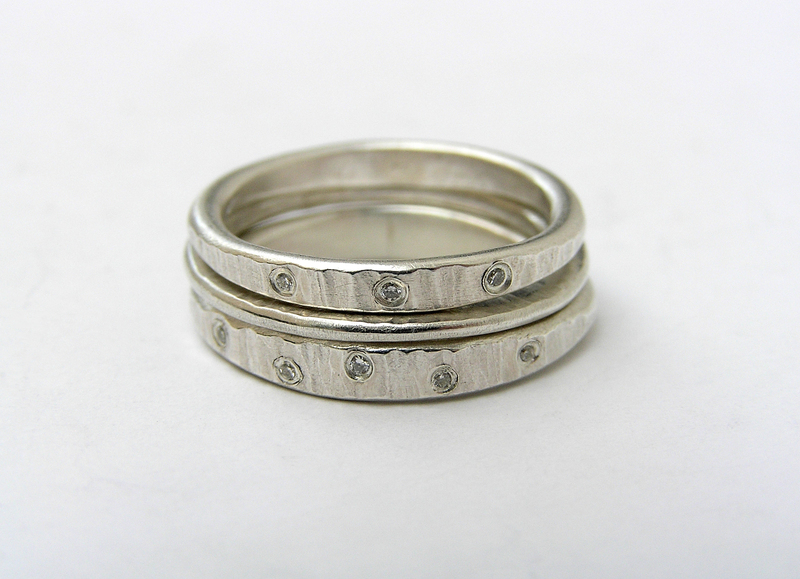 Slim ring approx 3mm wide, wide ring approx 4.5-5mm wide, each set with 6x 1mm scatter diamonds. 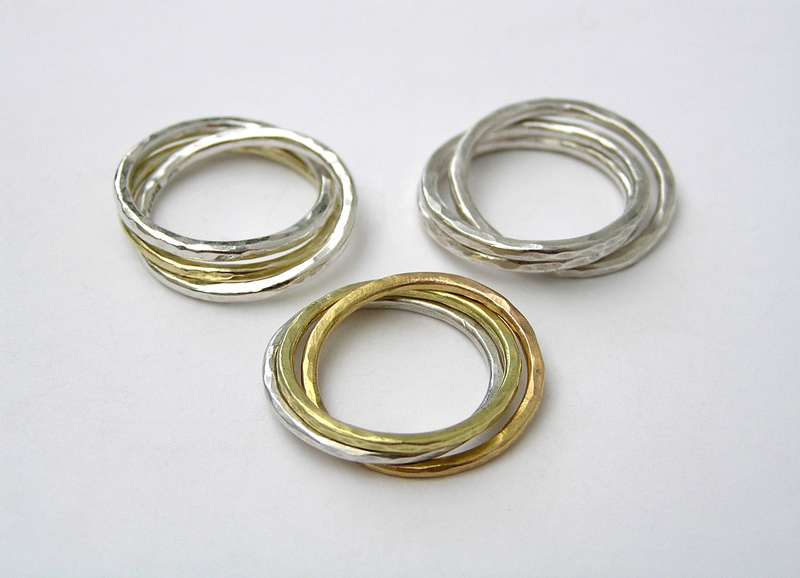 Slim ring approx 3mm wide, wide ring approx 4.5-5mm wide. 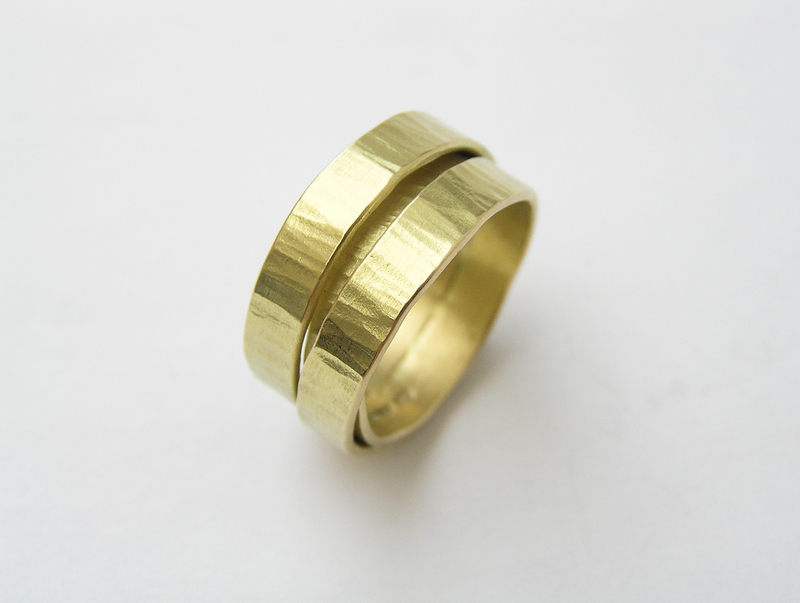 Overall width of band is approx 6-7mm. 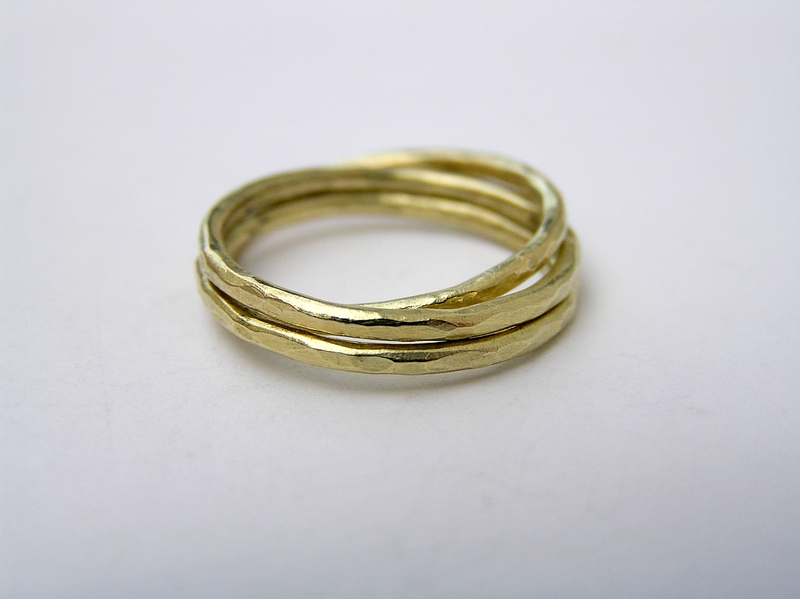 Overall width of stacked bands approx 6mm. 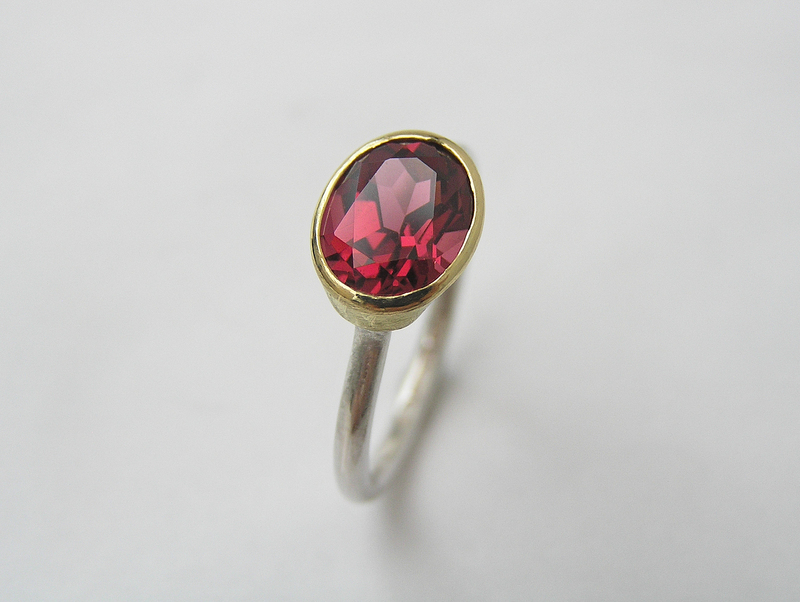 Stones shown vary in size from approx 3.5mm - 5mm. 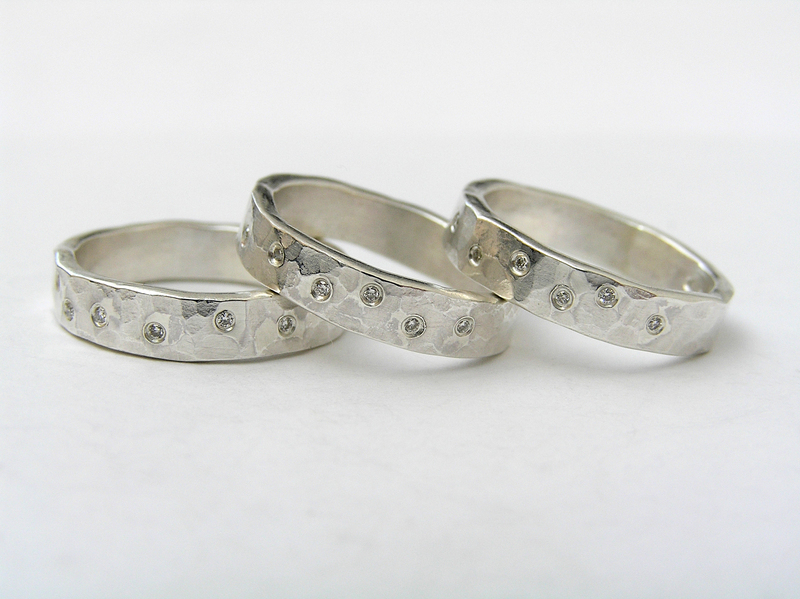 Set with customer's own stone, size approx 10x8mm. 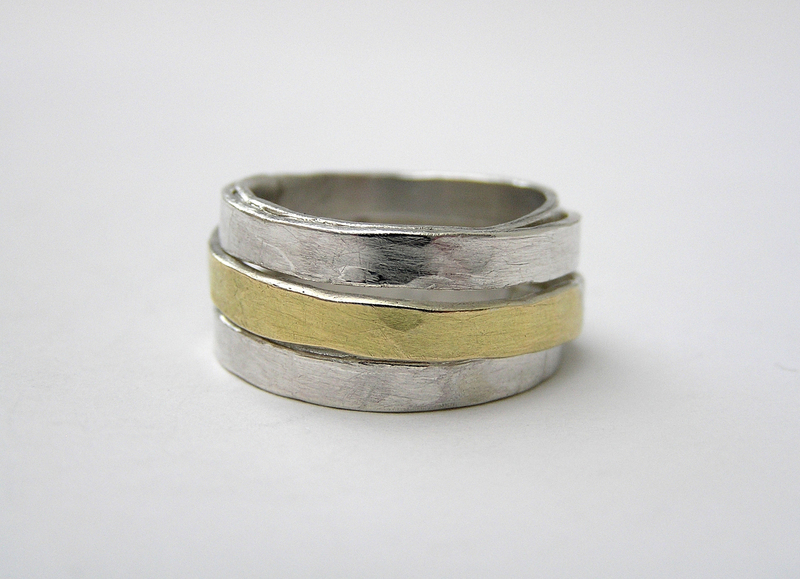 Two Dimpled wide bands, each approx 4.5-5mm wide, worn stacked with Glimmer band, approx 2.5mm wide. 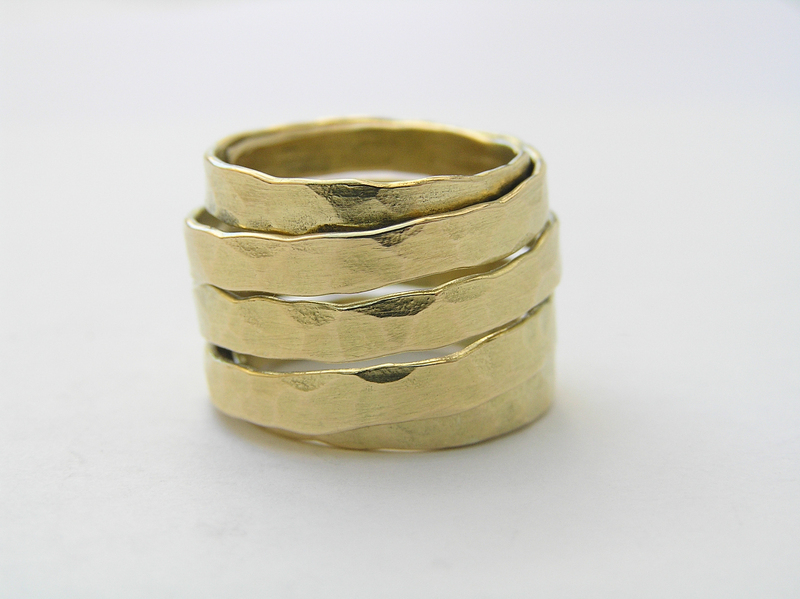 Overall width of stacked bands approx 7mm. 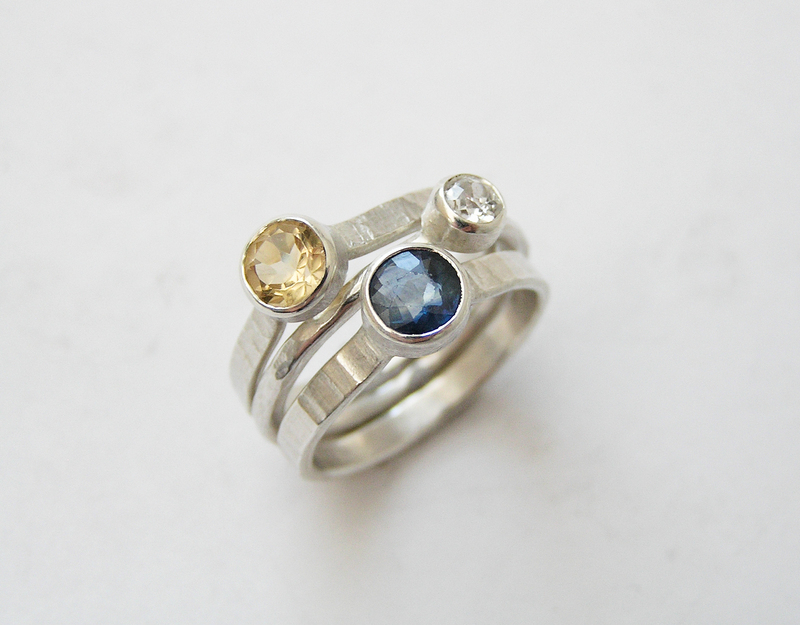 Stones shown vary in size from approx 3mm to 6mm. 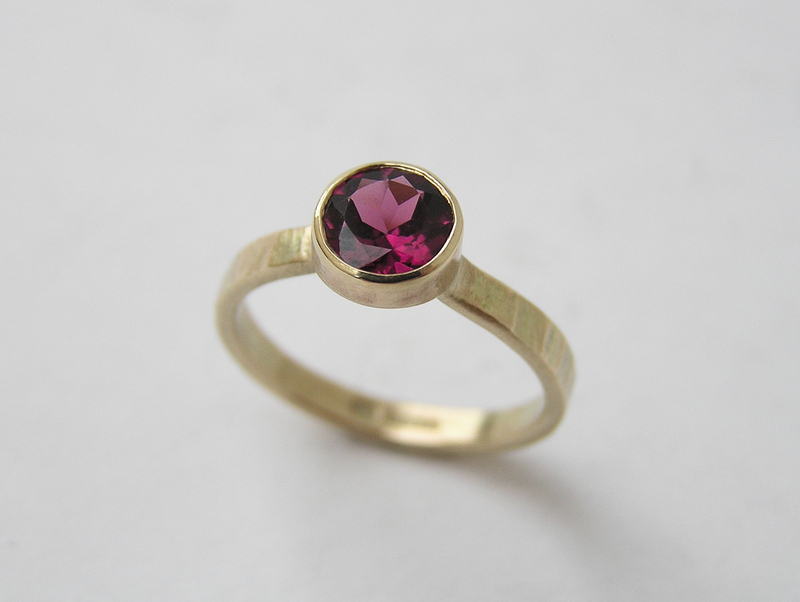 Stone shown is 9x7mm Rhodolite. 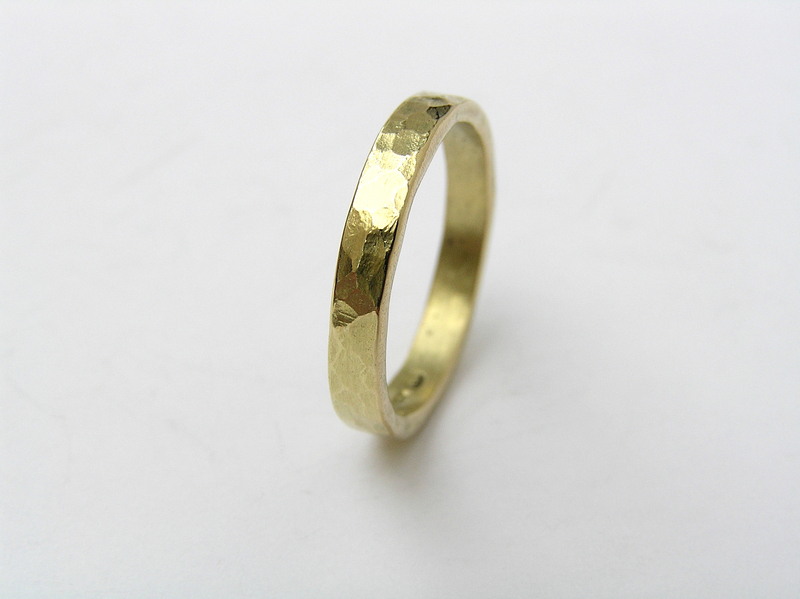 Top approx 11mm at widest point, back approx 3mm at narrowest point. .
Width of band approx 2mm. 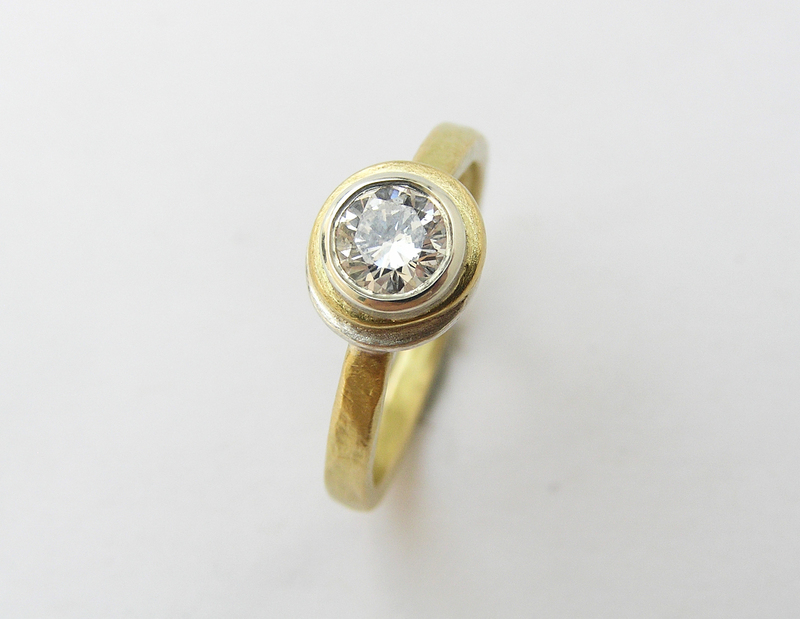 Diamond approx 4.5mm diameter. 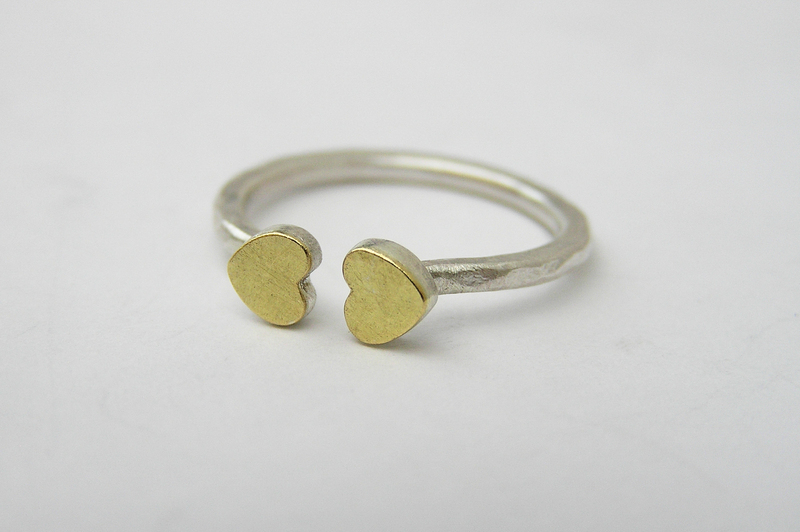 Hearts approx 5mm wide, band approx 2mm diameter. 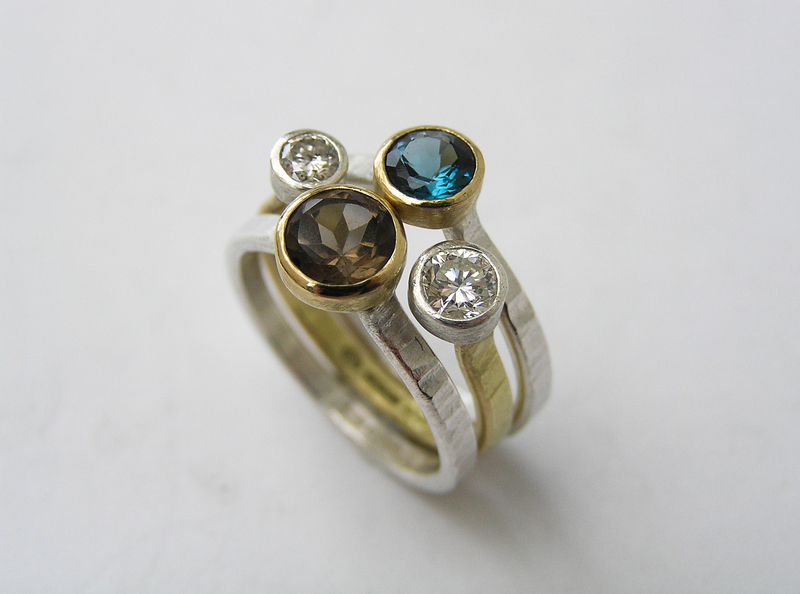 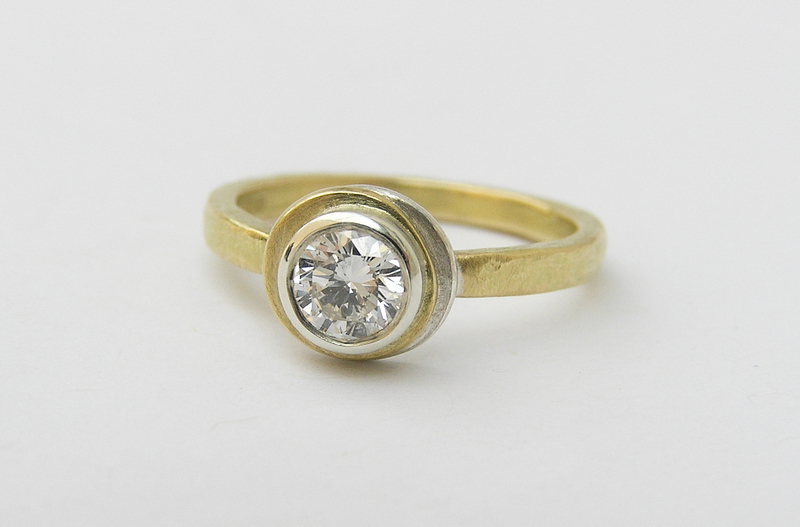 Incorporates materials and diamond from customer's existing ring. 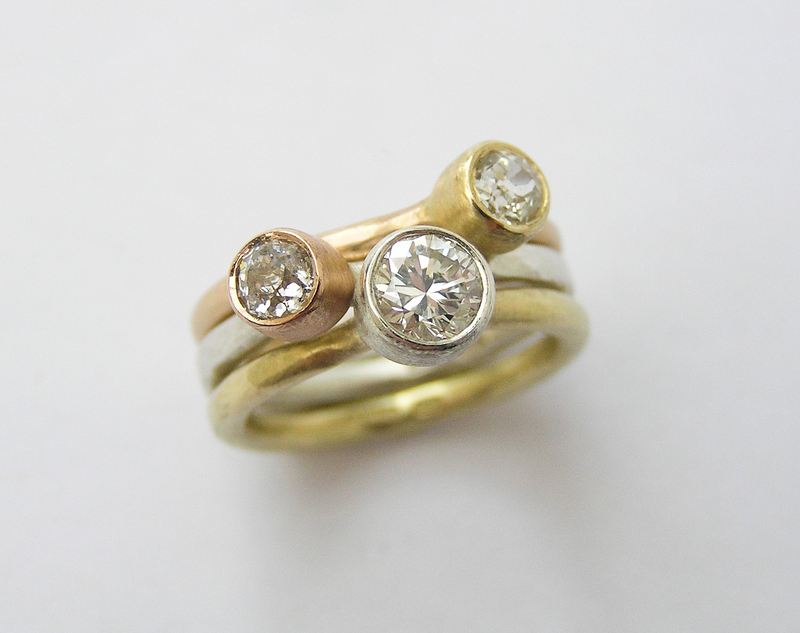 Diamond approx 5mm diameter. 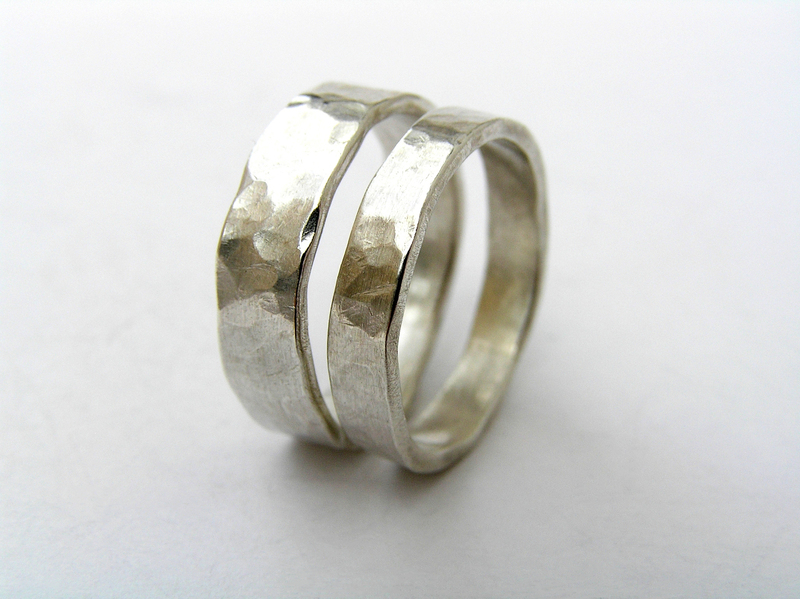 Silver approx 1.5mm diameter. 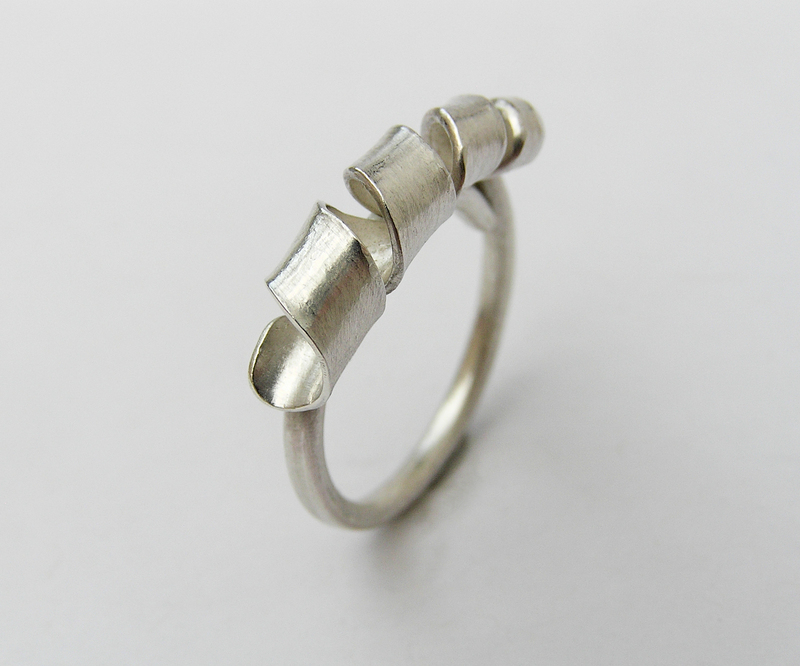 Ring made to be worn above knuckle. 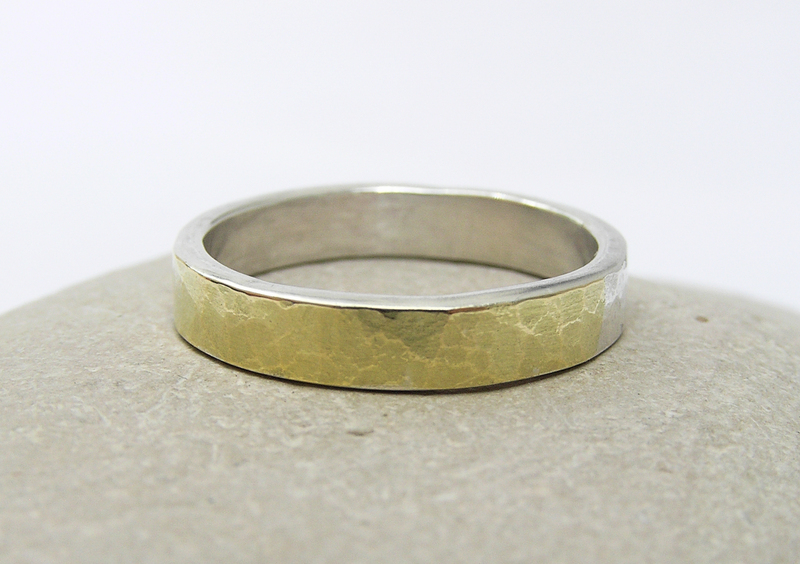 Diameter of band approx 2mm. 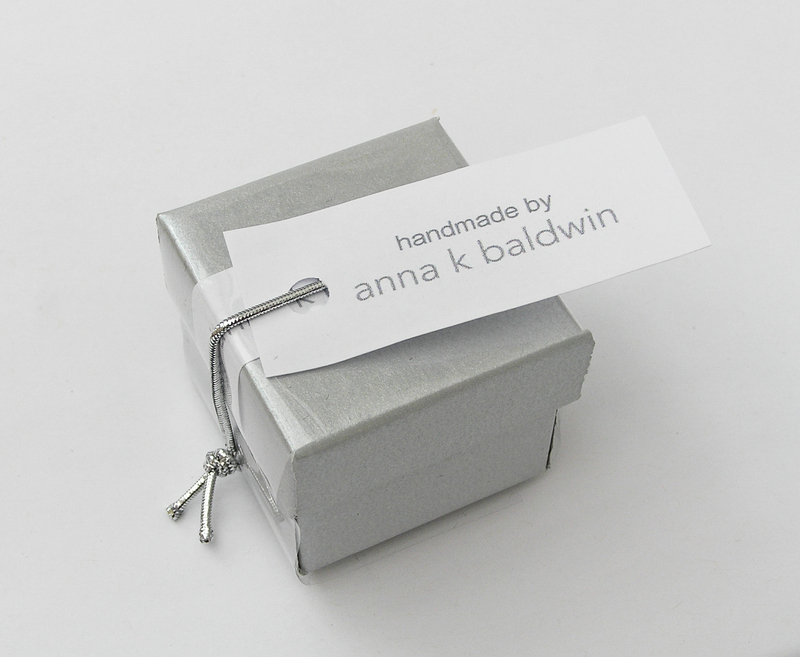 All items come beautifully gift-boxed. 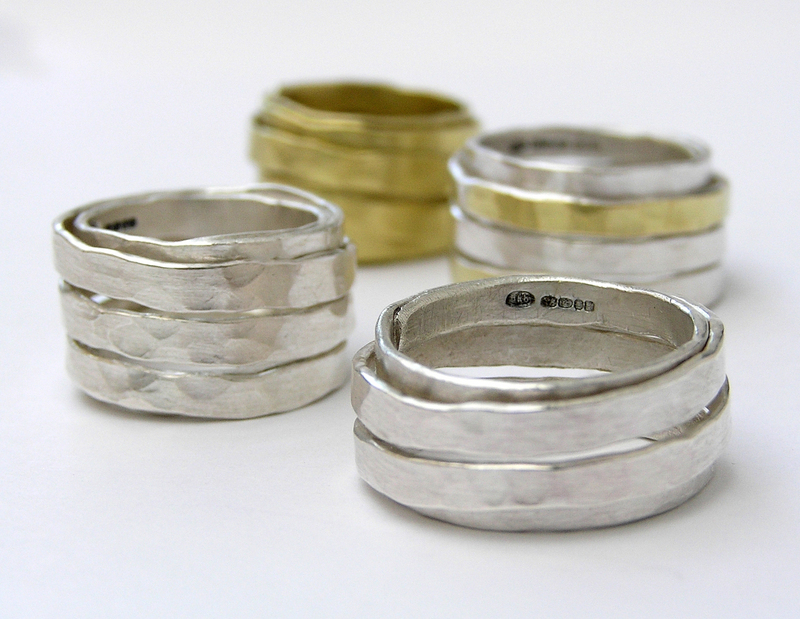 Diameter of each band is approx 2.5mm. 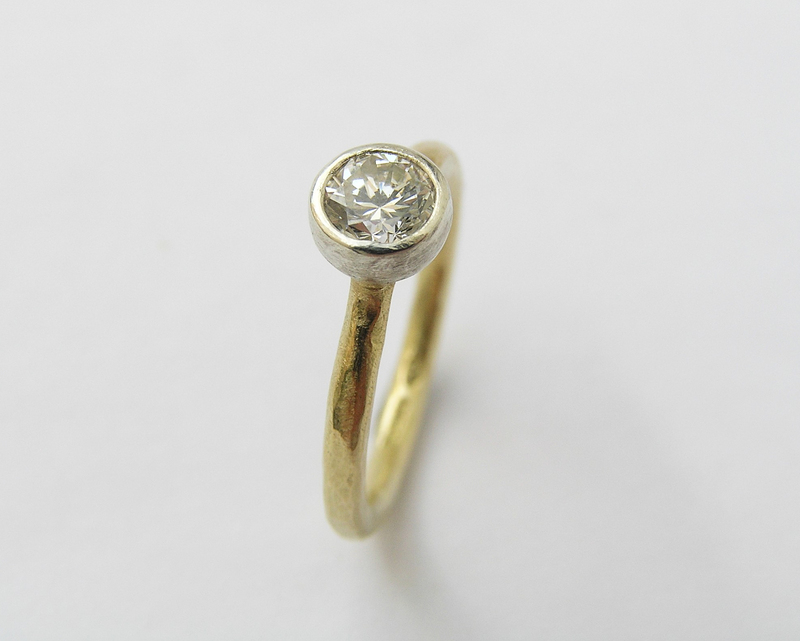 Solitaire diamond approx 4mm diameter. 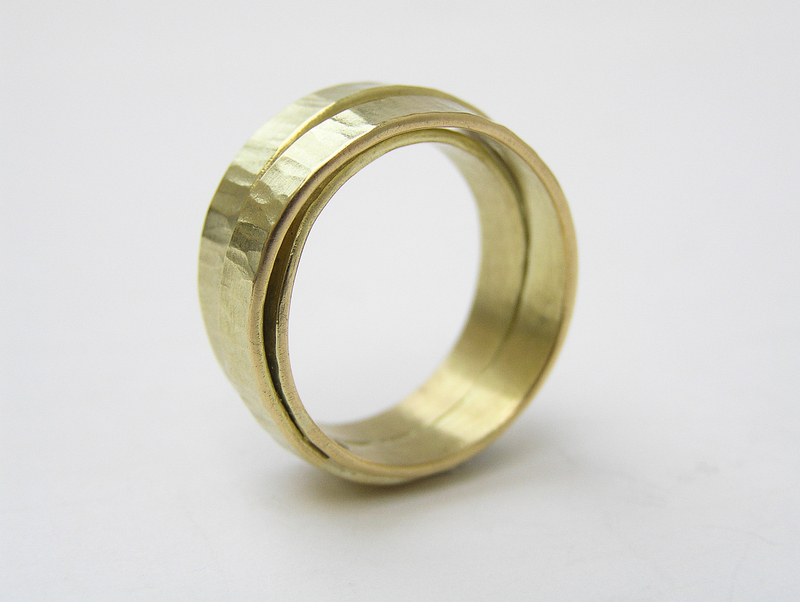 Overall width of ring is approx 8mm. 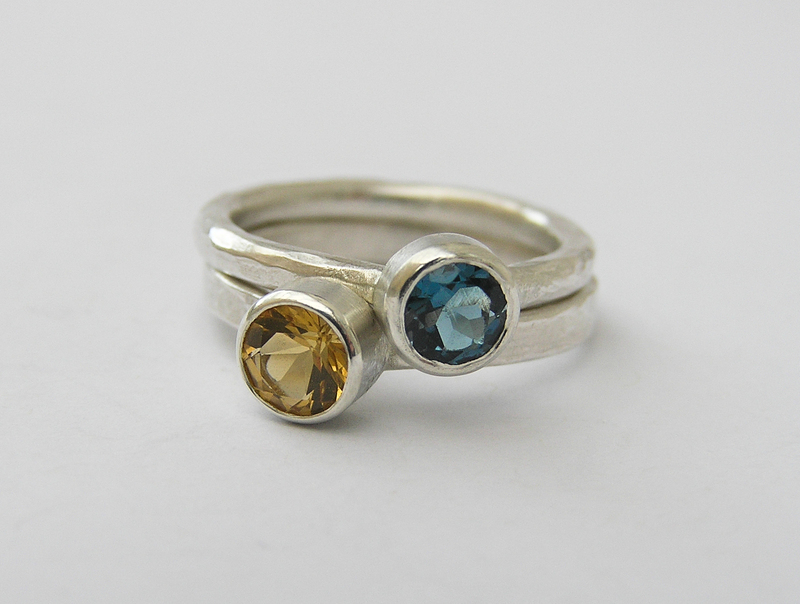 Stone set ring - Sapphire approx 5x7mm, ring shank approx 3mm wide. 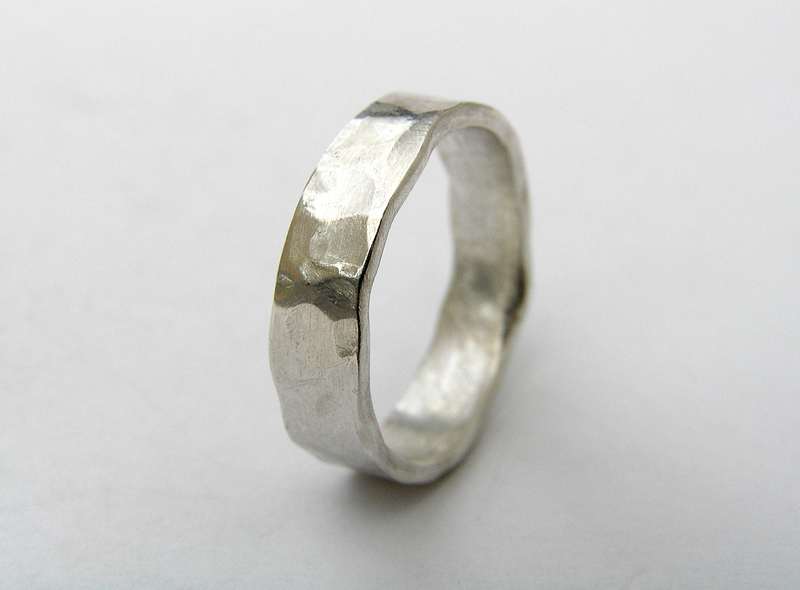 Worn with wide ring, approx 4.5mm wide.